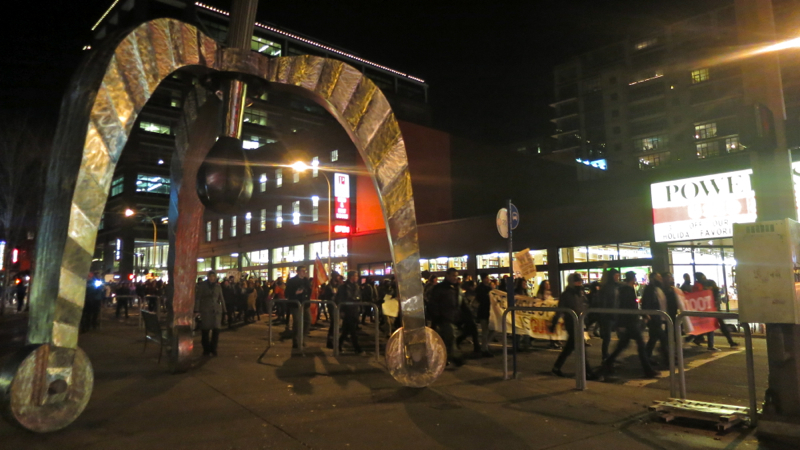 The previous Tuesday, marchers had succeeded in taking two bridges and briefly shutting down a freeway, as has become increasingly common practice for protests around the country of late. This time, the PPB were more prepared. Whenever the march would come anywhere close to the Burnside, Morrison, or Broadway bridge, a wall of riot cops would appear blocking our path. The irony, everyone joked, was the police were effectively shutting down the bridges for us, allowing the march to continue shutting down other streets simultaneously. 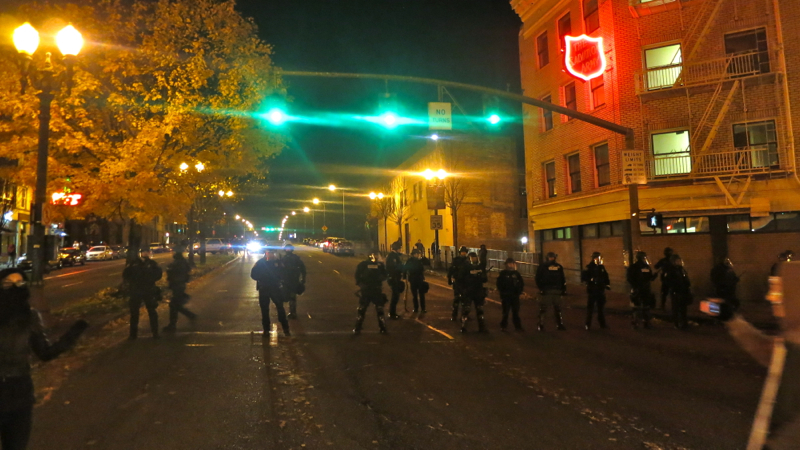 On a second approach towards the Burnside bridge, the crowd marched directly up to the wall of police. The level of tension increased for about several minutes until the crowd finally moved south onto SW 2nd ave away from the black-clad riot cops. 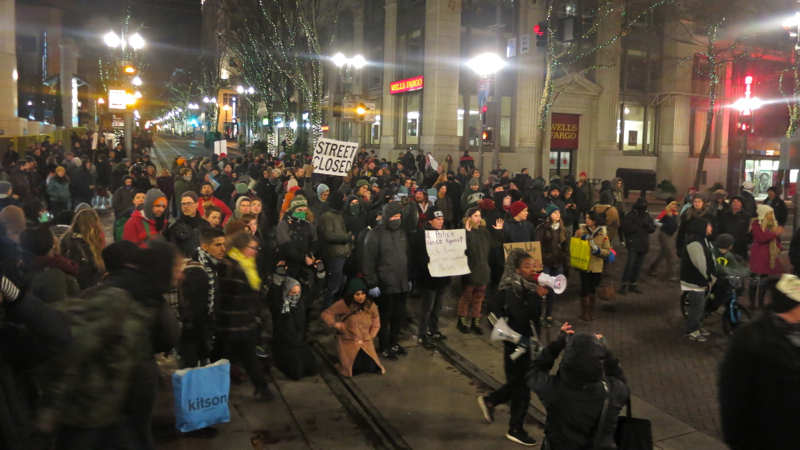 Nearing Pioneer Courthouse Square, the march stopped in the street, continuing to follow chants led by a young woman on the megaphone. It was here that the first major confrontation of the night took place. 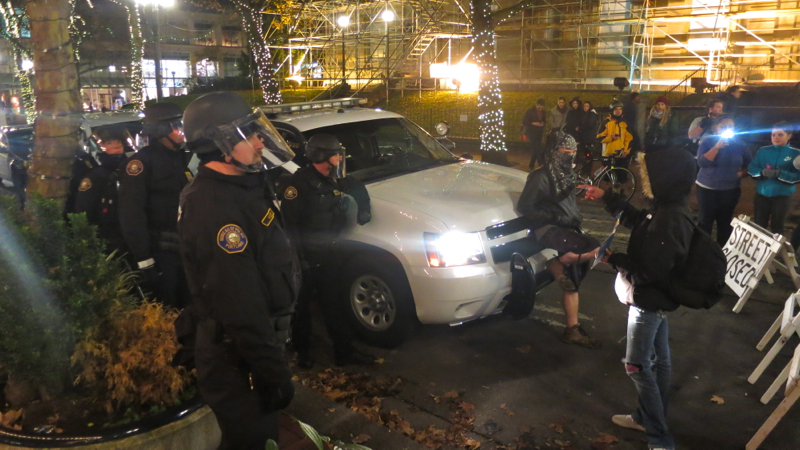 A lone individual was noticed leaning on a PPB vehicle parked nearby. It didn’t seem as though this man had been with the march from its beginning. 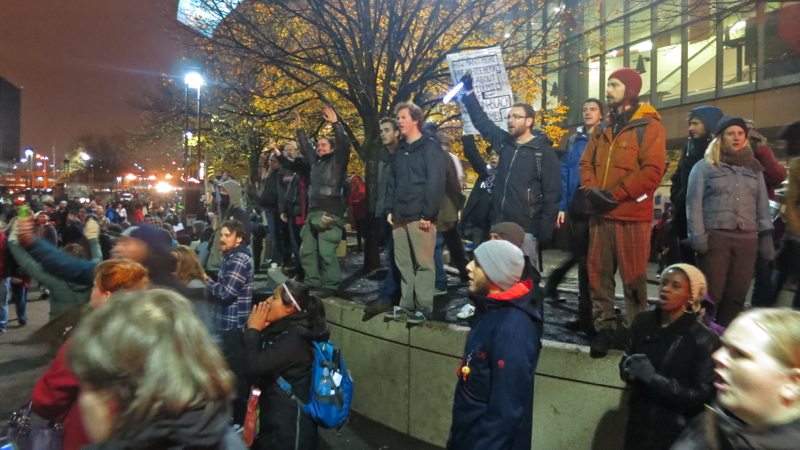 A small crowd began to gather apart from the march. 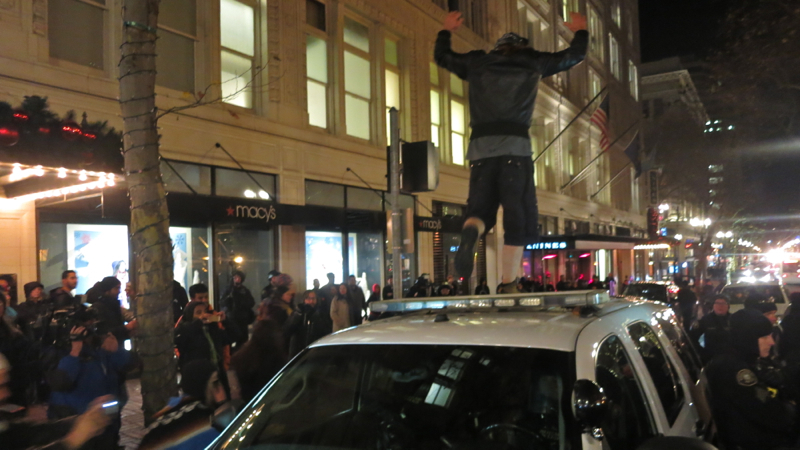 Once the man realized he had an audience, he climbed up on top of the vehicle as several cops surrounded him. Some in the crowd cheered his act of defiance. Others expressed concern that this might be a provocateur, and that the march was being distracted into another standoff. It didn’t seem to matter soon, as moments later the entire crowd moved in to for a better view. Several officers attempted talking the man down, but to no avail. When they began to slowly move the vehicle, the man simply threw his hands in the air and jumped from the hood to the roof of the vehicle. 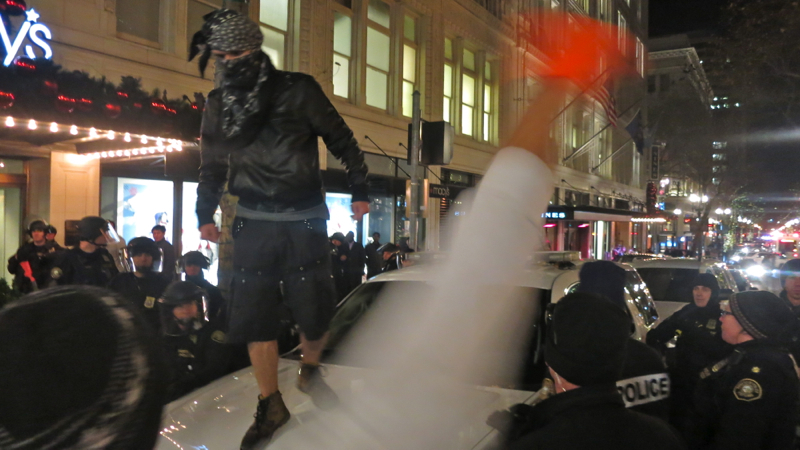 Suddenly he jumped off the back of the cruiser just as riot cops rushed onto the scene, shoving the crowd back with long batons. 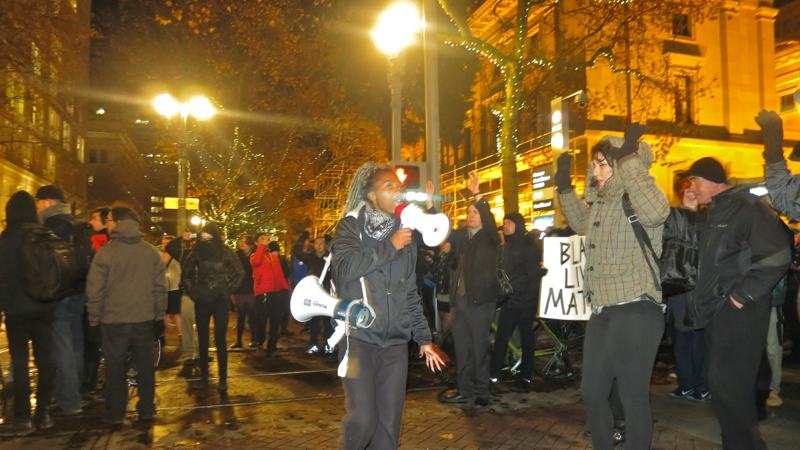 Over a loud speaker, the PPB began making announcements to the crowd. 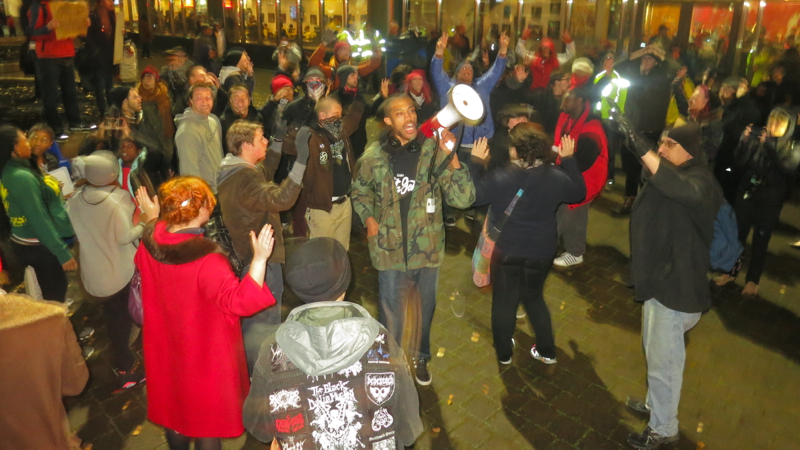 It was difficult to hear over people shouting protest after being battered by the officers. A final, more audible announcement stated that the lie of riot cops would retreat, and the crowd was not to advance as police moved away. This seemed a bit of a taunt, as making demands of an anti-police brutality march is a sure-fire way to guarantee marchers would do the opposite. 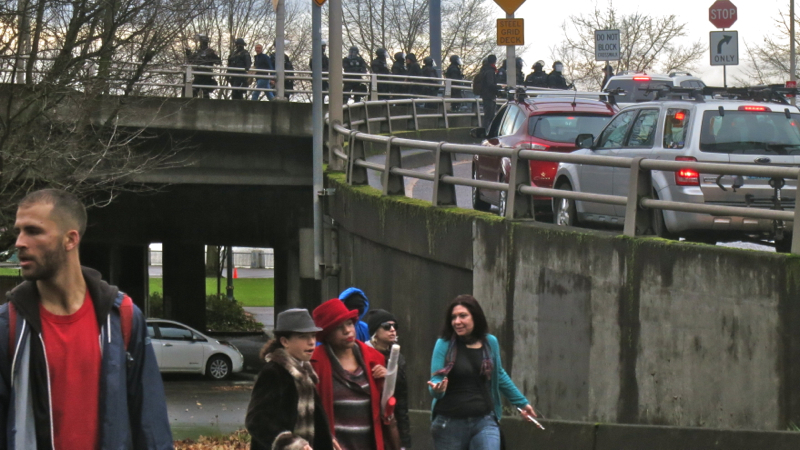 Sure enough, the crowd followed as the officers retreated. 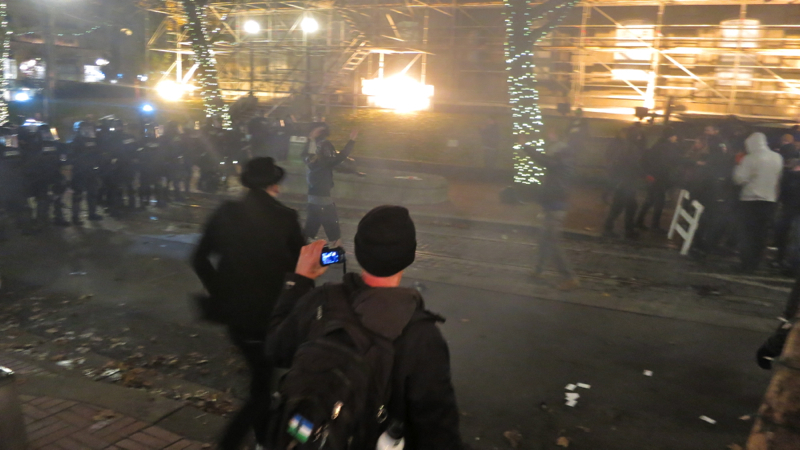 Then, without warning, three explosions went off in rapid succession at the feet of the advancing protesters. 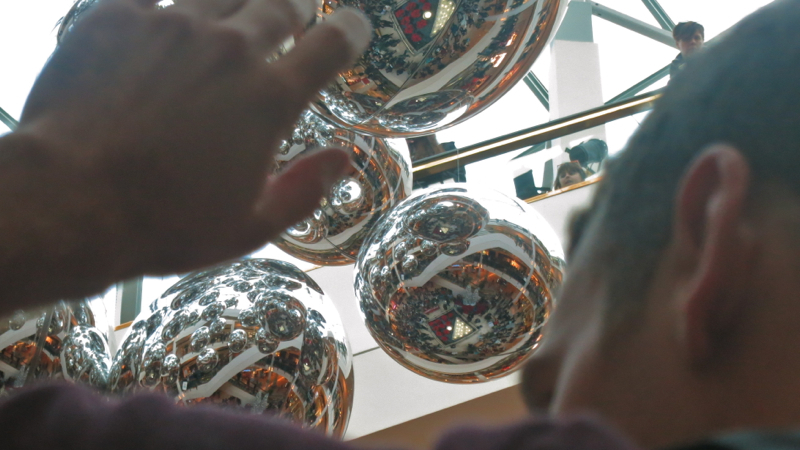 People screamed, scattering in all directions. 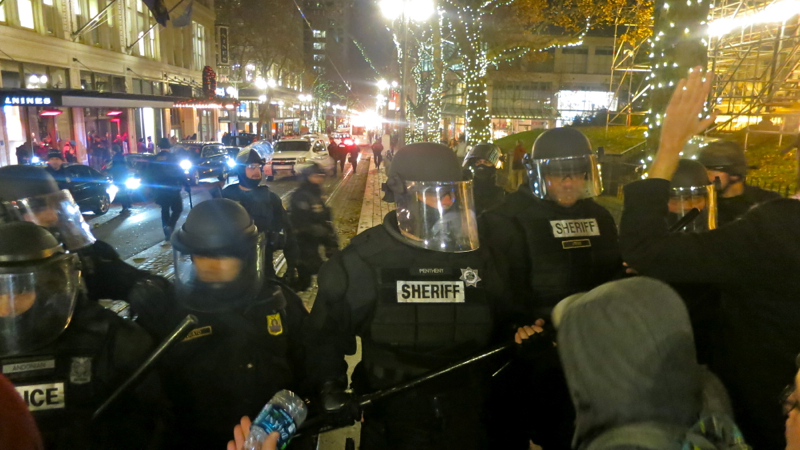 PPB had deployed concussion grenades commonly known as ‘flash-bangs’. 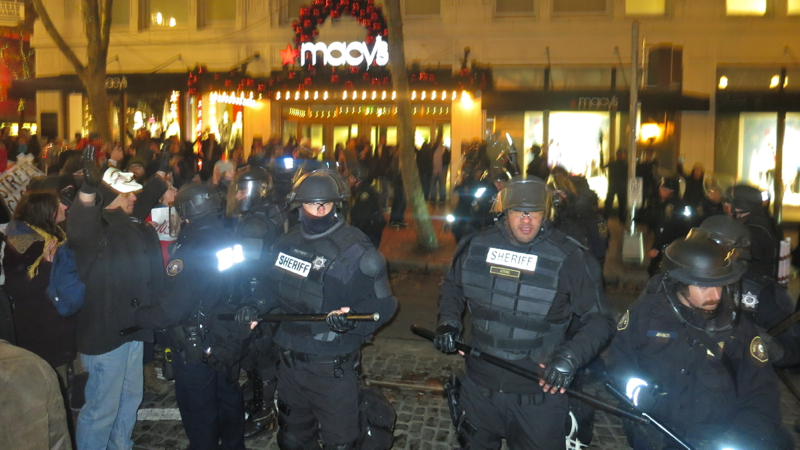 In the panic, officers let only seconds pass before rushing the crowd, striking people with their batons. I have no photos of this moment, as I was hit in the back 7 or 8 times myself in rapid succession, being knocked forward several feet with each blow. 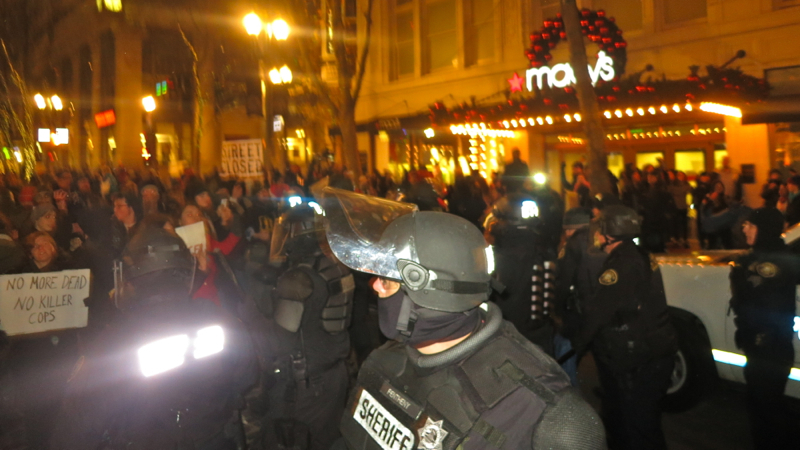 This was despite the fact that I was standing on the sidewalk at the time PPB rushed the crowd. It was hard to tell initially if anyone was injured, though I do recall seeing one person being dragged away to safety by two others. The police and the crowd regrouped. 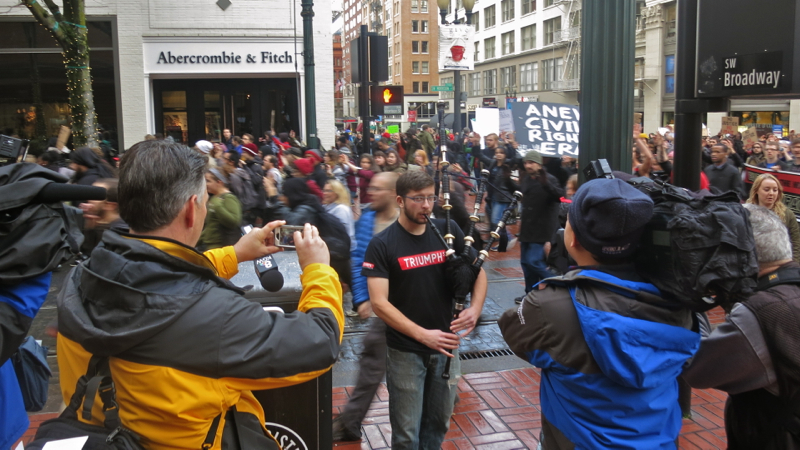 Over the PPB loudspeakers it was announced that a time and place restriction was now being enforced, and this was now an unlawful assembly. The march paid little mind to this command, and continued on its way. 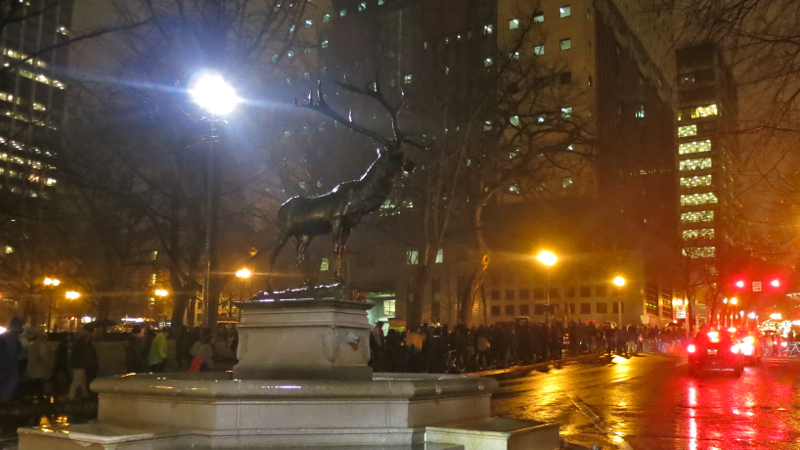 While the crowd remained emboldened, I was feeling far more cautious. 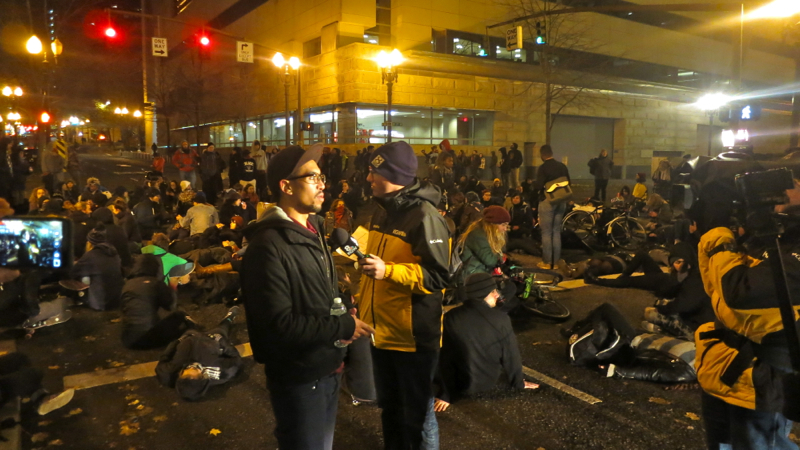 As we proceeded, I remained on the sidewalk along with camera crews from local TV news, as well as Portland Mercury news editor Denis Theriault who was busy live-tweeting the night’s events. 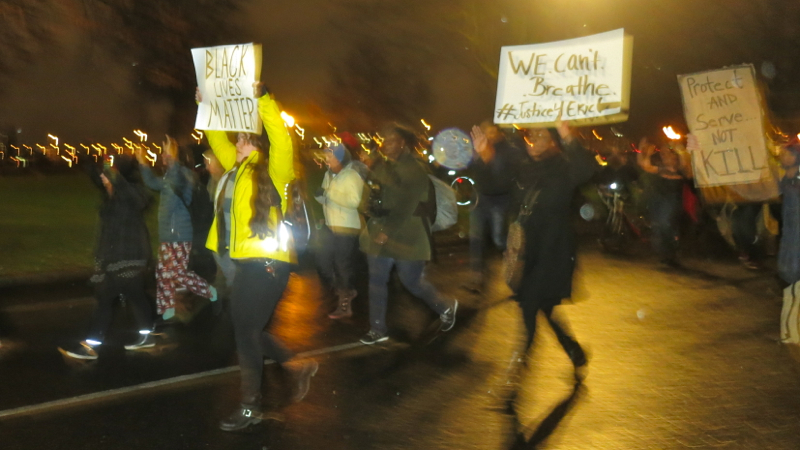 The march stopped at one point and it was announced that we’d been rallied and marched officially for 4.5 hours, a goal sought to highlight the four and half hours Ferguson police left Michael Brown’s dead body lay in the street in what many felt had the same effect as a public lynching. The young person on the bull horn shouted, “Do you wanna end this, or do you wanna keep marching?” The crowd roared support for pressing on. 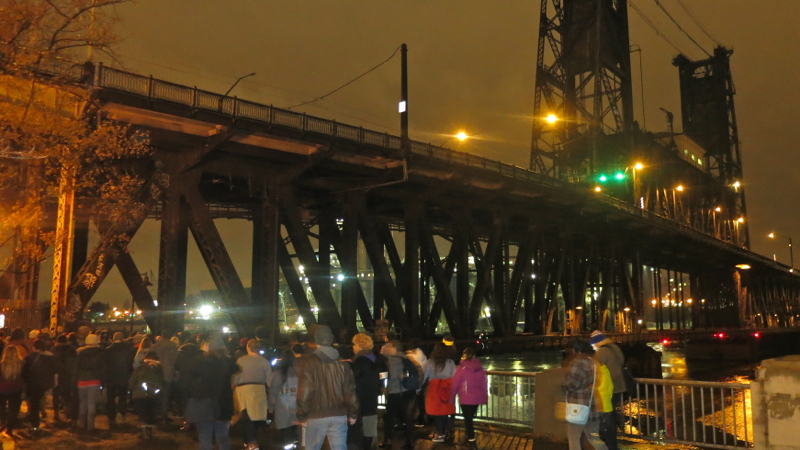 The changing continued, louder than ever, as an attempt on the Hawthorne bridge was made. 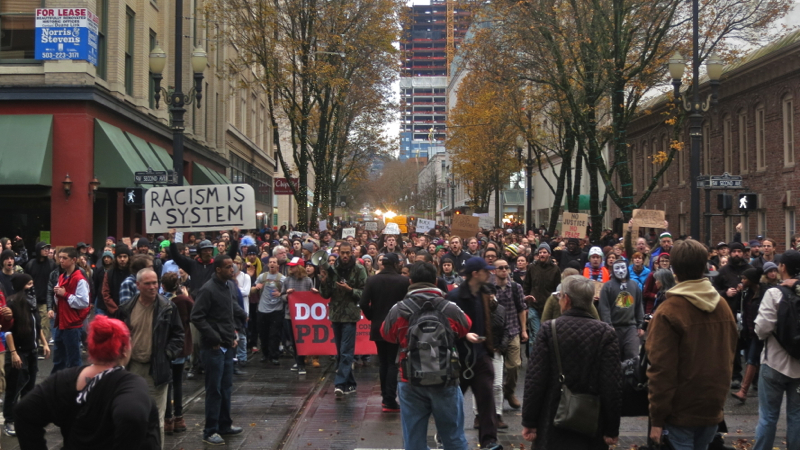 Predictably, the PPB made another block of our path. Then, the crowd changed tactics. Just a block away from the downtown police precinct, we stopped. Still several hundred in number, the crowd began laying down in the street. 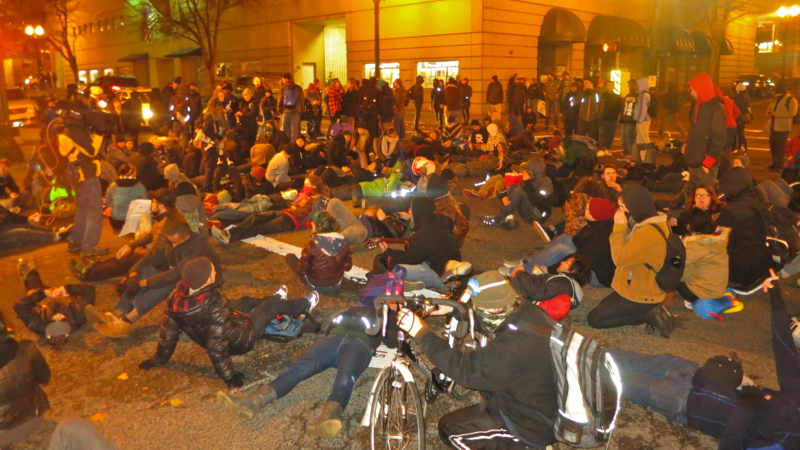 A die-in was being staged. Chanting continued. 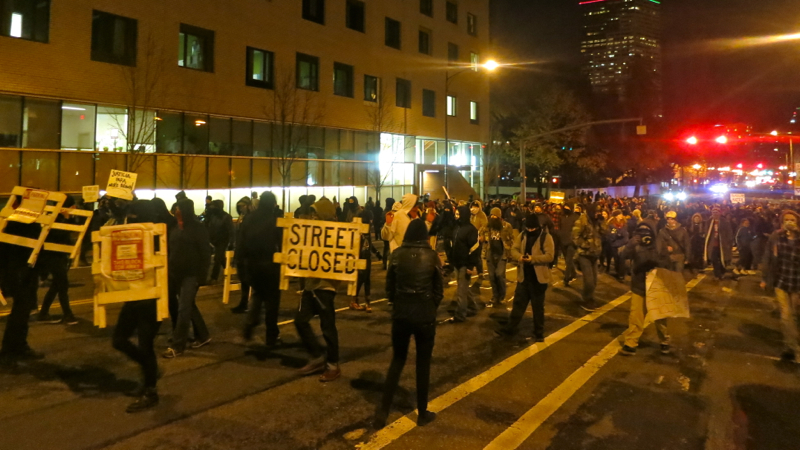 Jailed inmates in the windows of the Justice Center above flicked their lights on and off in support, waving down to the crowd who waved back. 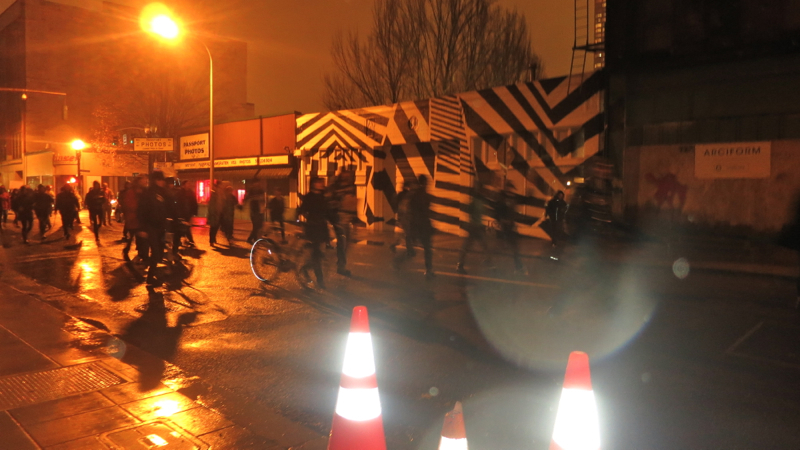 Then, the PPB showed up, in all directions, all at once. 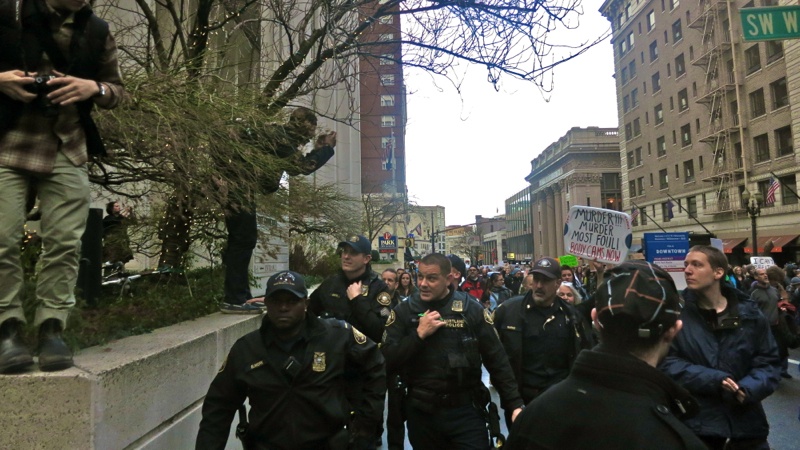 Over their loud speaker it was announced, “This is the Portland Police Bureau, you are ALL under arrest.” This seemed absurd, as more than half of those present were on the sidewalk, and weren’t in the street at all. 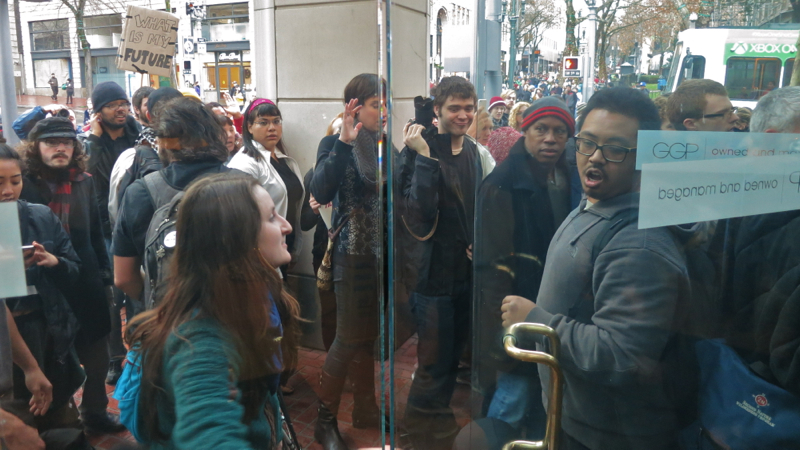 We were being kettled, all of us. 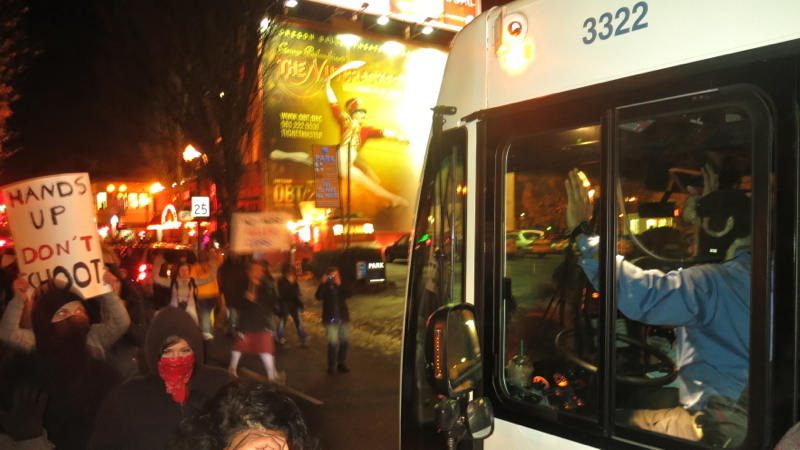 Those who tried to remain on the sidewalk were shoved into the street as the four walls of riot cops moved in. Only the TV crews were allowed to exit. Denis Theriault made several attempts to identify himself, but no officers would engage him. 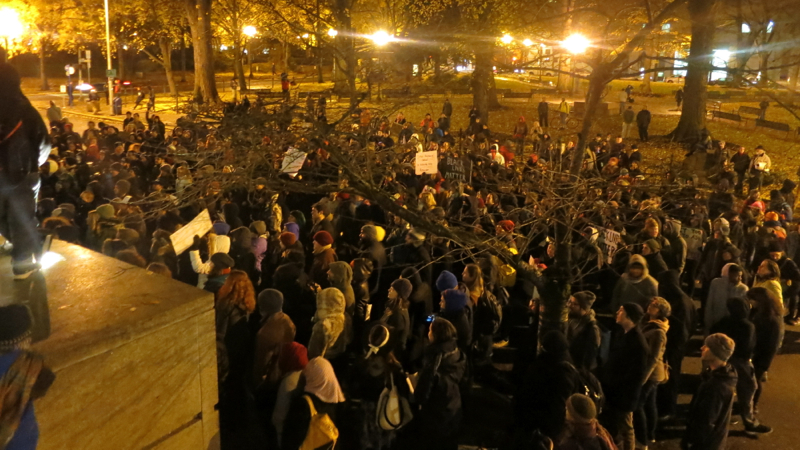 He ultimately moved into the center of the crowd, now packed tight on the Northeast corner. 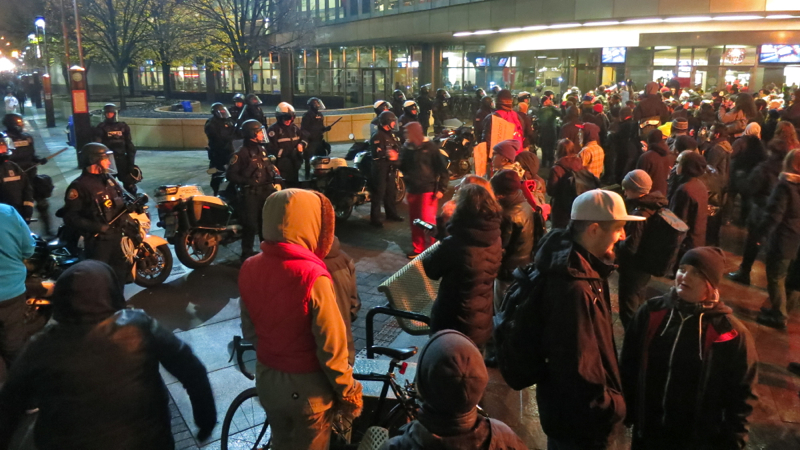 While it seemed unlikely PPB would take 200 people into custody, it was clear that somebody was going to be punished. While few complied with the order to go to the center of the intersection, I remained in the street in the crosswalk, inches from the curb. When an officer firmly grabbed my arm and began to pull, I didn’t resist. I was promptly handcuffed and searched, my belongings bagged and cataloged, my photo was taken on the scene, and I was placed into the back of a police van along with 5 other men. From the back of the van, we could hear additional commands being announced to the remaining crowd, which we later learned was allowed to disperse eventually in pairs down a gauntlet of riot cops. From here, we were driven miles away to the East Precinct for interrogation. 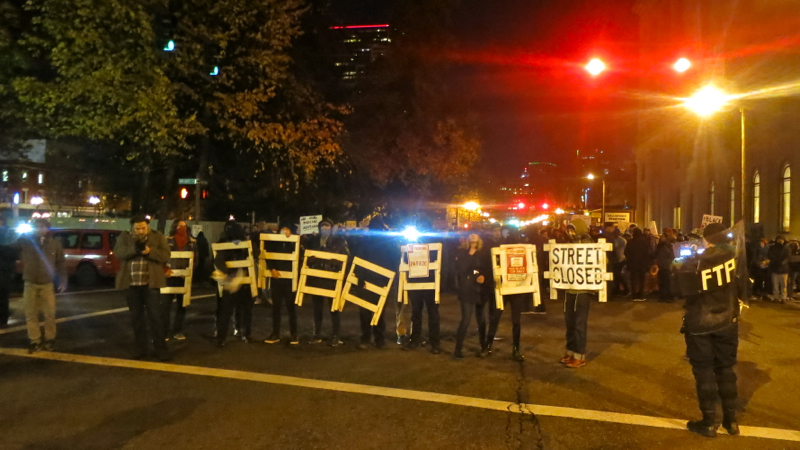 For almost four hours we remained in handcuffs, ten of us in all – 6 men and 4 women. 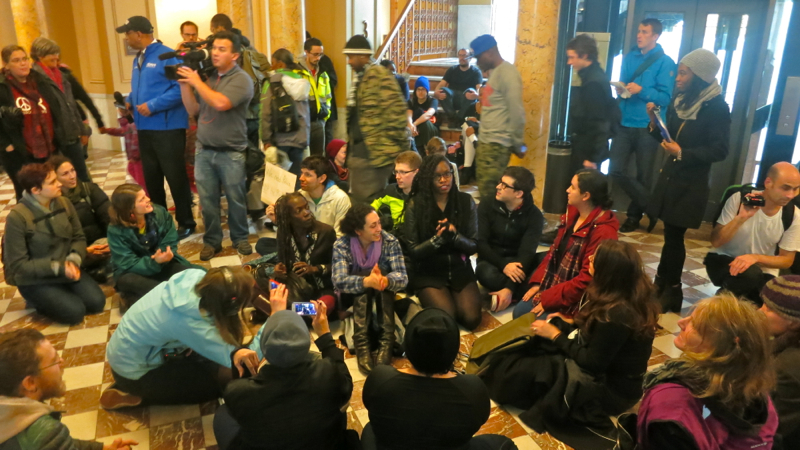 We were told there simply wasn’t room for us at the downtown precinct, which seemed to be an admission of the bureau’s own limitations in placing protesters in custody. After this, we were driven back to the county jail for booking. Another six boring hours later I was released, but my personal belongs were not. My keys, my phone, my camera, and my wallet were all kept as evidence. I had no way to go home, no way to buy food, and no way to call for help. Luckily, another young man released drove me to a friends house, where I knocked on her window asking for help. It was around this time I noticed the name on my release form stated the booking officer was Richard Storm, who was not supposed to be assigned to protest duty by order of the mayor after he and several officers were caught showing their support for Darren Wilson on Facebook. Ironically, Rebel Metropolis played an initial role in helping out these officers in what would quickly become a national story. I contacted several members of the media, and few hours later Richard Storm’s name was again in the news alongside my own. The next couple days were a blur of fielding media inquiries and trying to figure out my own case. I’d been charged with disorderly conduct, as had the others. 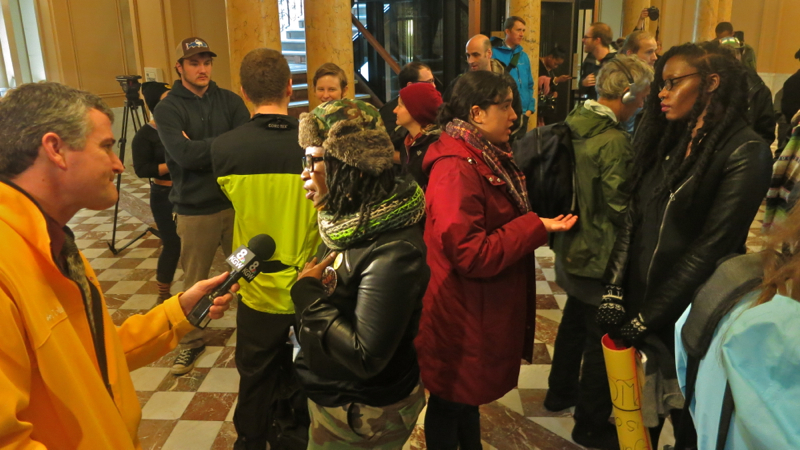 The Monday after our arrests, Don’t Shoot PDX organizer Teressa Raiford had all of us and more descend upon city hall to file complaints with the city’s auditors office. Some 30 complaints were filed. I personally spoke with an investigator who recorded my testimony, as did many others. IPR Director Constantine Severe says his office got no complaints about marches earlier in the week. Just Saturday. 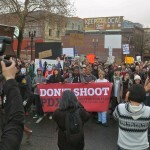 It was announced shortly after an IPR investigation into PPB’s use of force against us would be opened. The next morning at our arainment, the deputy district attorney announced we were free to go, our changes were being placed in ‘no complaint’ status, meaning we could be recharged at any time up to six months from now, though our National Lawyers Guild-appointed lawyer said in front of TV cameras outside the courtroom this was unlikely due to the high cost of pressing such charges through a jury trial. 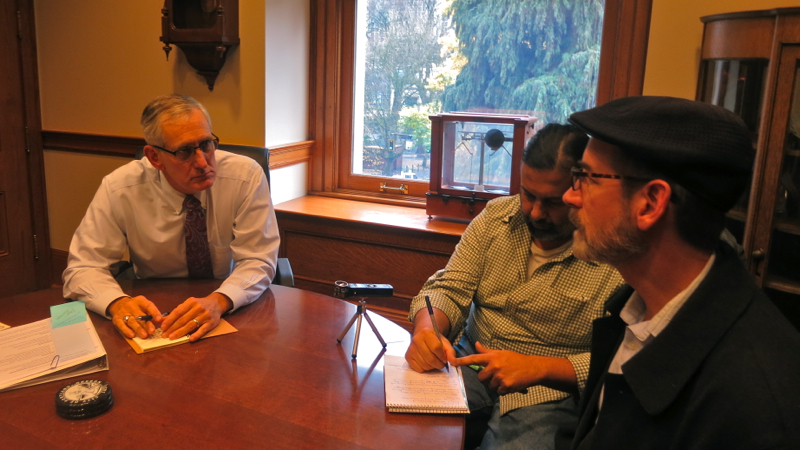 Throughout these few days, I spoke with the media about my own case and PPB attacking us with concussion grenades and batons. When asked about the larger implications of the national movement going on, I refrained from commenting and directed them to specific people of color whose voices would better be served. When asked if I felt if I’d been targeted for my work as a blogger, I replied no, that the real people being targeted by law enforcement were black and brown lives. 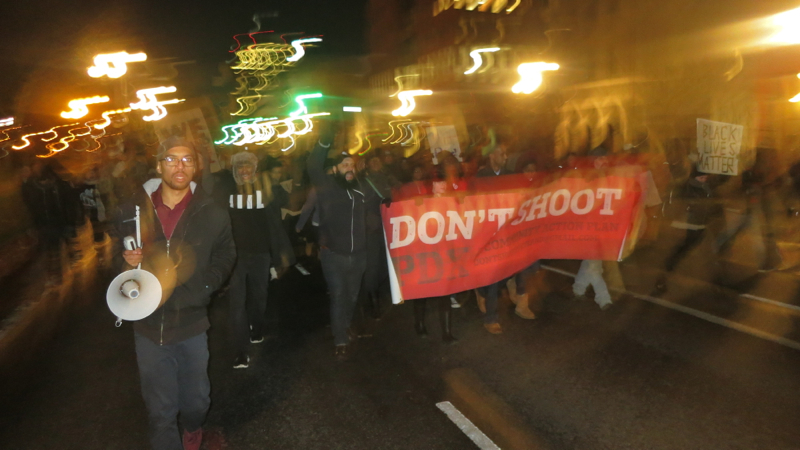 Once the dust of it all had seemingly settled, the people behind Don’t Shoot PDX wasted no time in taking back to the streets after it was announced Eric Garner’s NYPD killers would also face no indictment, despite suffocating him with an illegal chokehold. 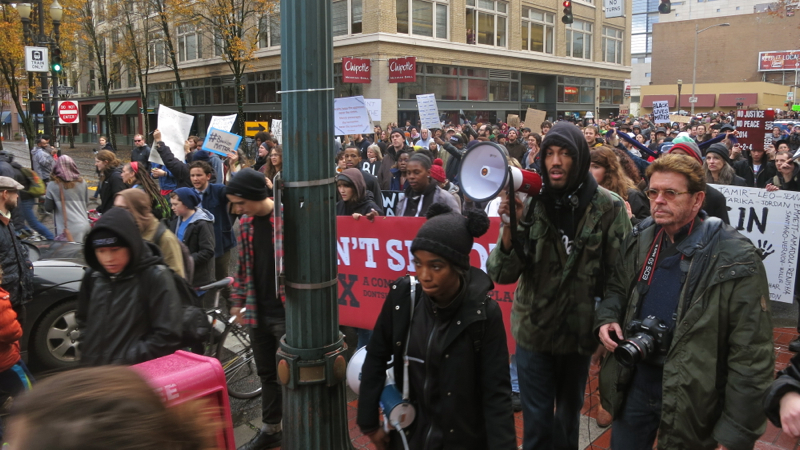 While there was a march planned to start from north Portland and proceed south along MLK Blvd, another march assembled again at the Justice Center downtown. 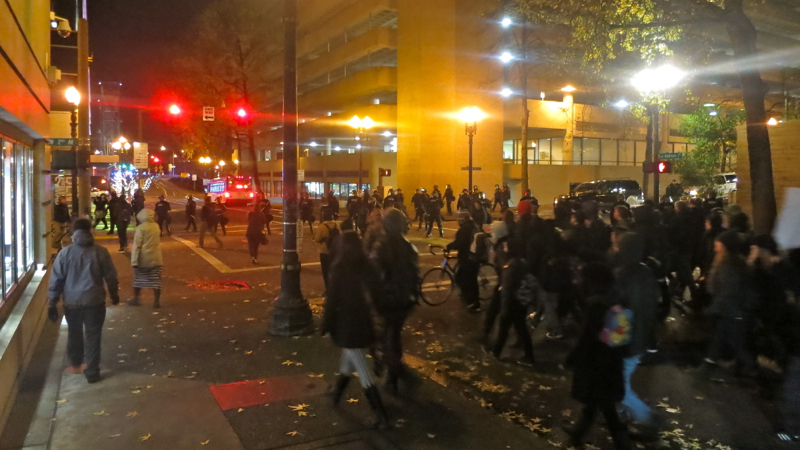 Having seen much brutality employed previously by the PPB, this march started far more cautiously, sticking to the sidewalk for the first few blocks. 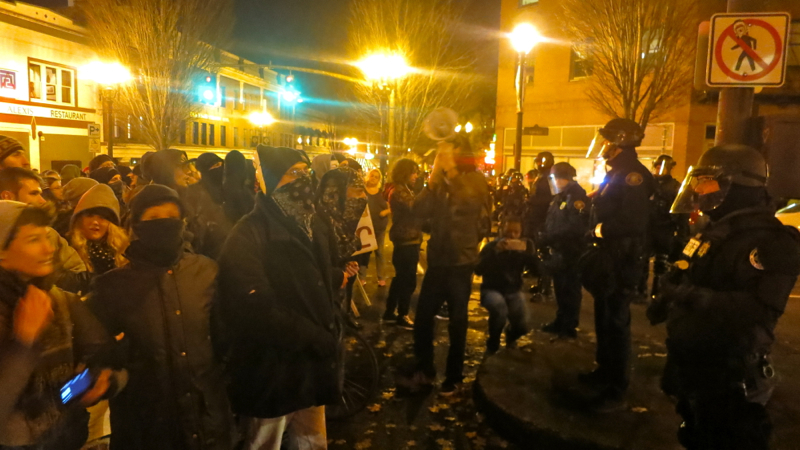 Once it was clear the police were keeping their distance, the crowd spilled out into SW 3rd ave. 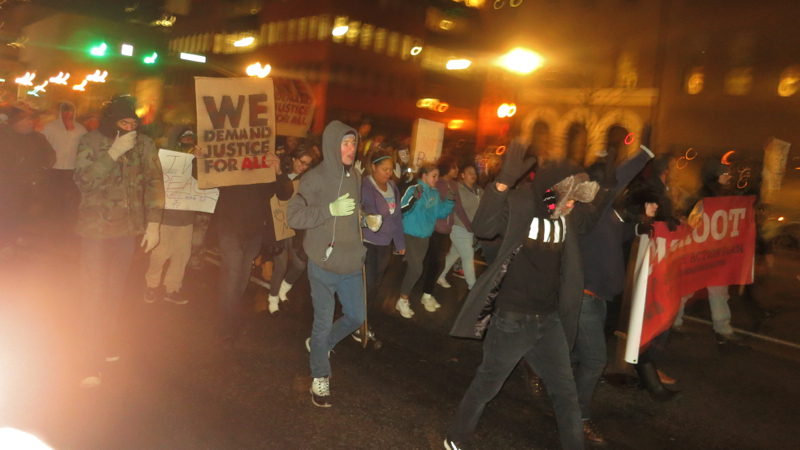 While moving fast and chanting loud, this particular march lacked the energy of previous nights. 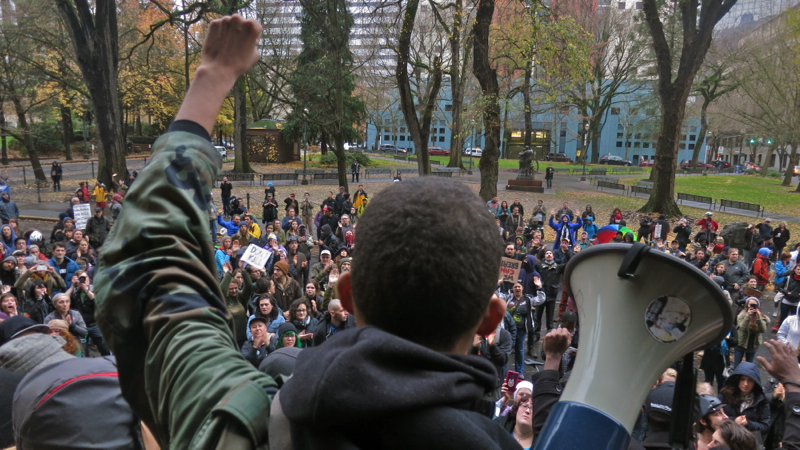 I wondered how the other march in north Portland was fairing. 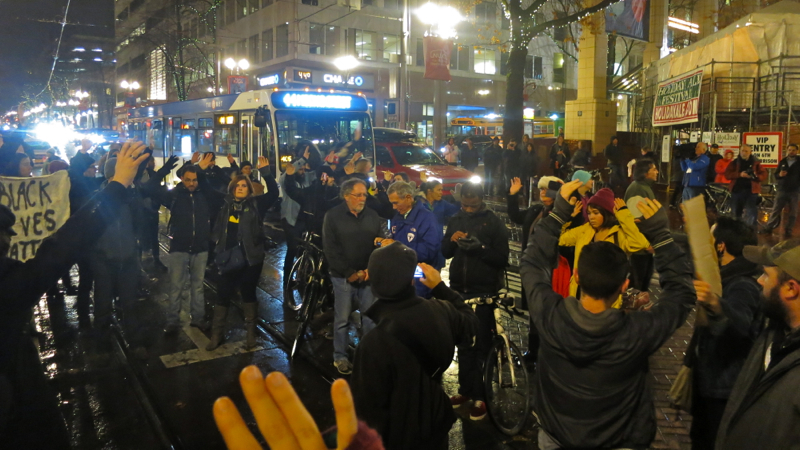 Stopping near Pioneer square, the march held a moment of silence for Eric Garner, noting his final words were repeated 11 times before he died: “I can’t breathe.” While almost all motorists we’d encountered were patient and respectful, one young white man blared his horn and comically threw his hands up like he was having a temper tantrum. 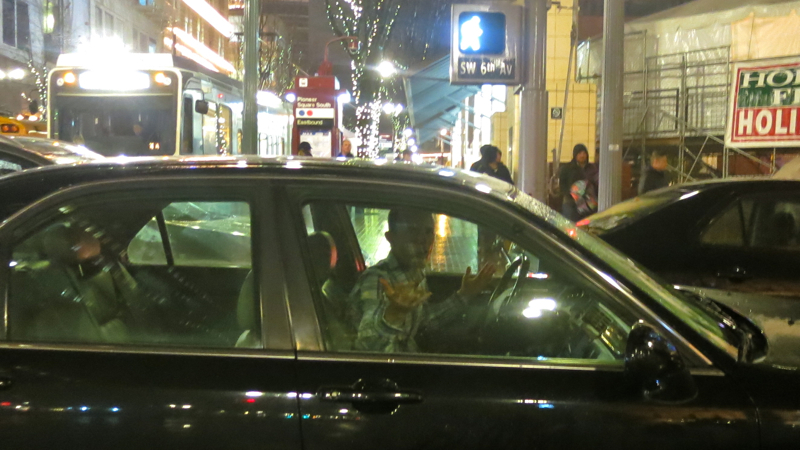 Several people surrounded his car, making him well aware of whose streets these were. 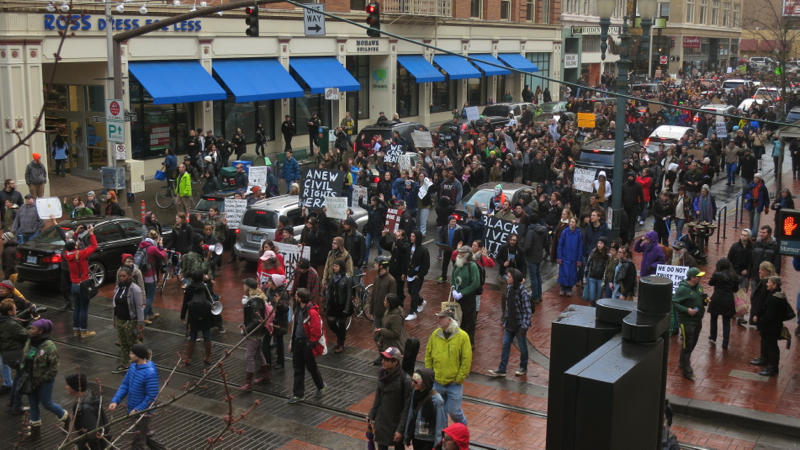 From here the march pressed on across the Willamatte river via the pedestrian deck of the Steel bridge. Word was we were to meet up with the other march currently heading south. Once both marches combined, the tone heightened substantially. The energetic young black men who’d led previous night’s marches were here now, and the crowd’s size and voice grew considerably. 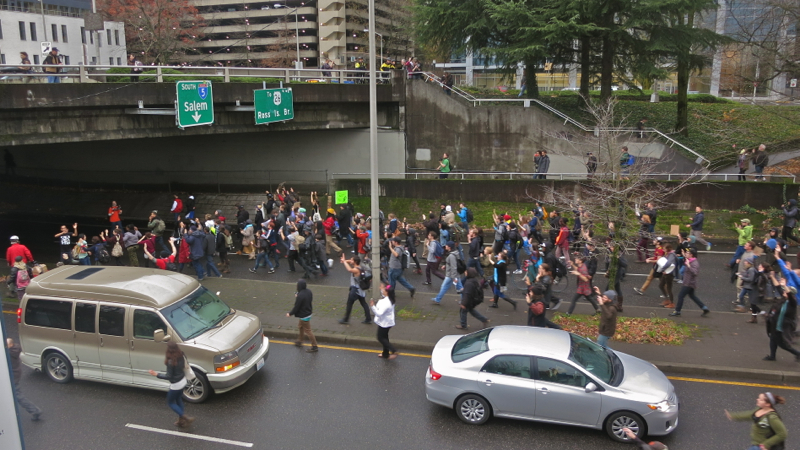 Passing under the I-5 freeway we arrived at the Moda Center, where riot cops were already waiting. 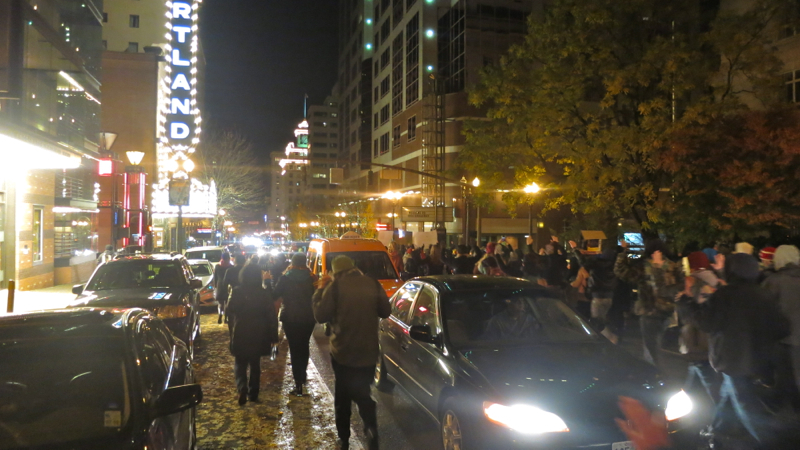 The crowd made no attempt to enter the stadium, however, where a Portland Trailblazer’s game was in progress. 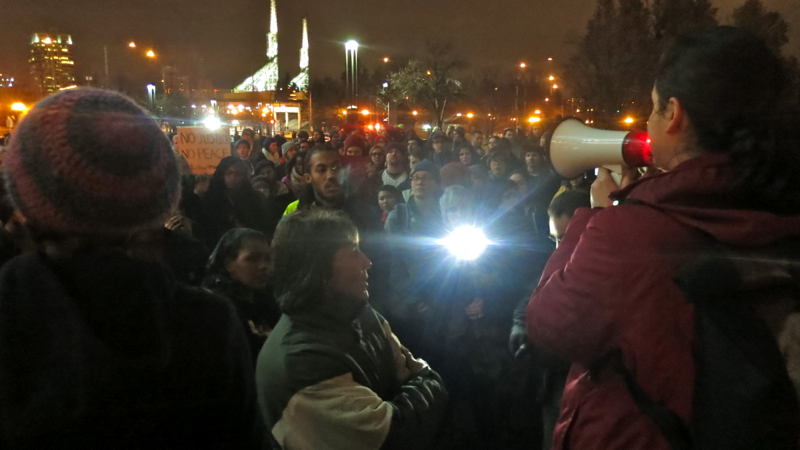 Here, the leaders of the march spoke for some time, inviting others to raise their voice. Almost all received sustained rounds of applause and cheers. One young white man made the mistake of saying this wasn’t about race, that “All lives matter.” He was quickly boo’d off the megaphone. 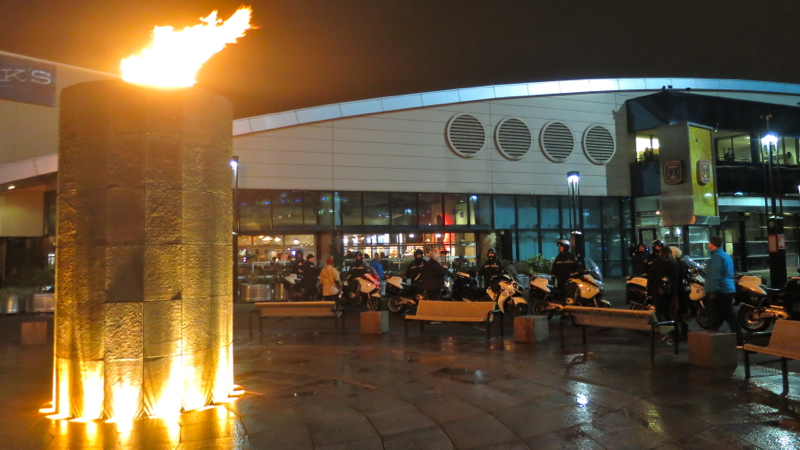 As the game ended and attendees let out, the police formed a line between protesters and spectators. The crowd relentlessly chanted “Black lives matter!” and “I can’t breathe!” as sports fans trickled out into the night. 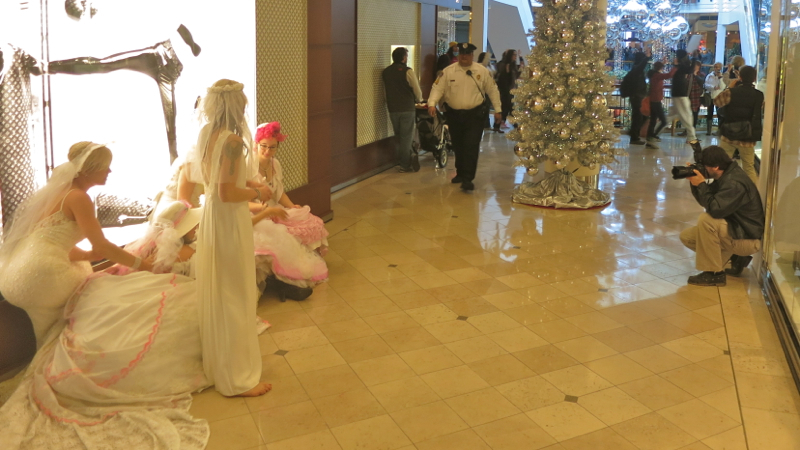 Eventually the police realized their own presence was impeding foot traffic, and they made a hasty withdrawal. 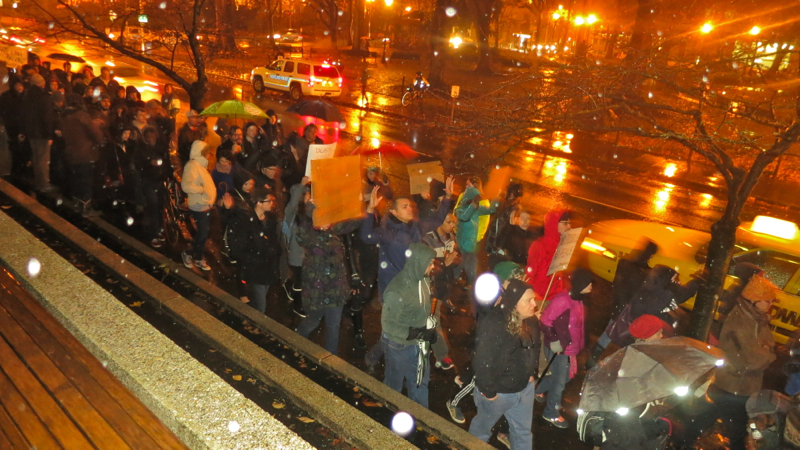 The march cheered, rushing in to fill the space now opened. It seemed a small victory for control of the square, but still a noble one. 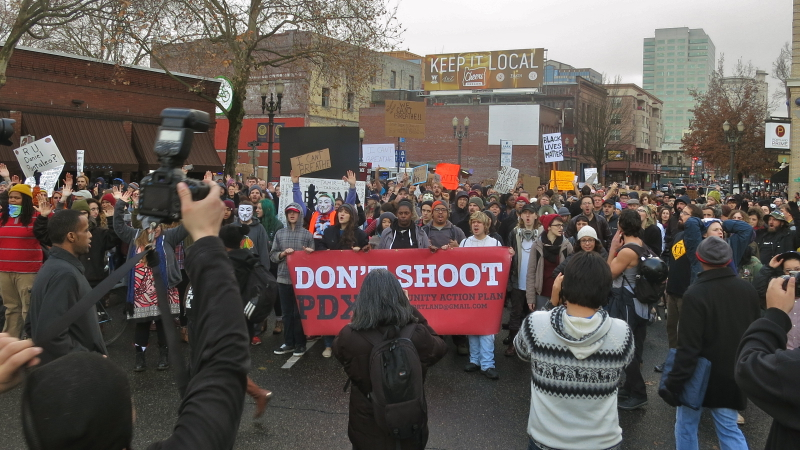 Just days later, yet another march organized by Don’t Shoot PDX assembled near the Justice Center at the Edith Green – Wendell Wyatt Federal Building for a daytime event. Speakers stressed the need for federal grand juries to step in to do the job that state grand juries had failed at. 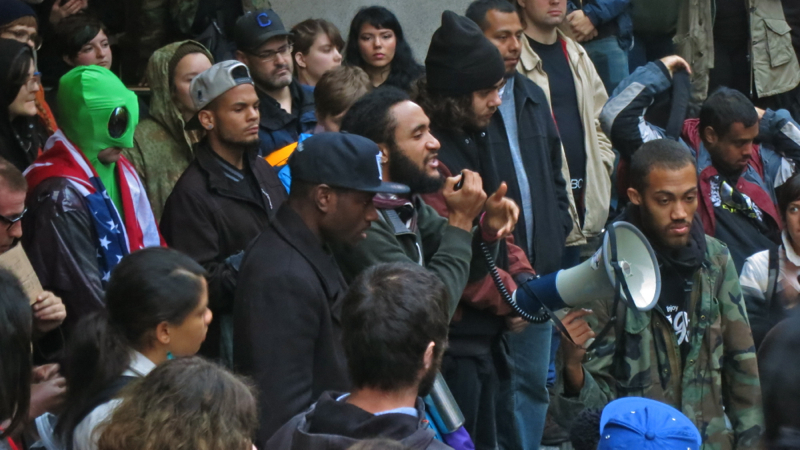 There was also some focus given to the role of anarchists in the struggle for justice in the face of police violence. 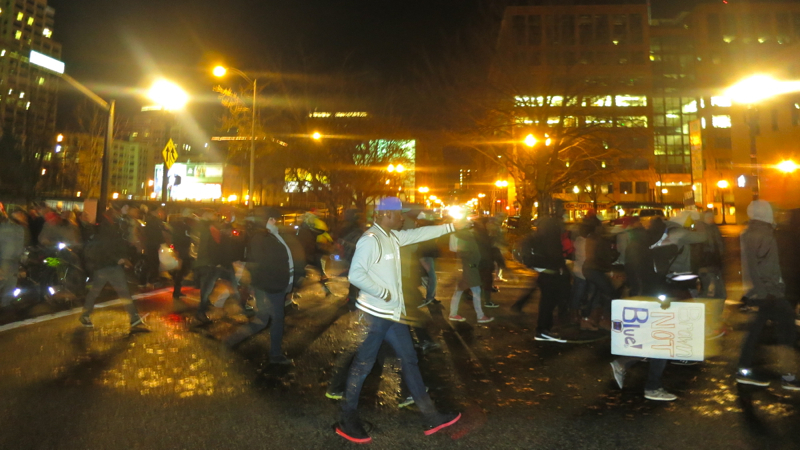 Once the rally was over, the crowd of some 600 or so took to the streets, police observers in tow. 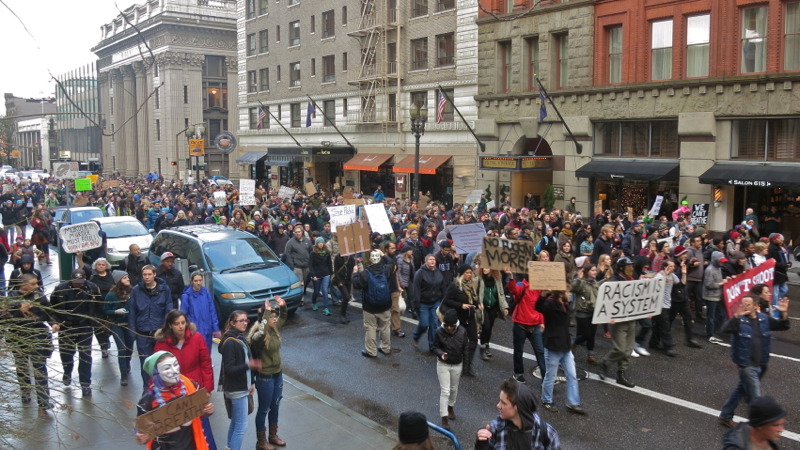 The mood was as strong and defiant as ever, but without the heavy-handed police presence the march moved from block to block feeling empowered and safe. 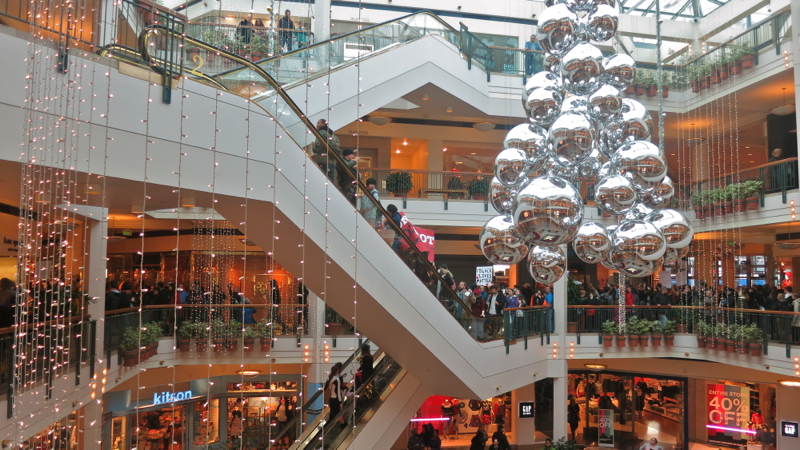 Being a December Saturday, downtown was full of bystanders doing their holiday shopping. This fact also likely tempered police response, as no mayor wants to be known for ruining Christmas with concussion grenades. 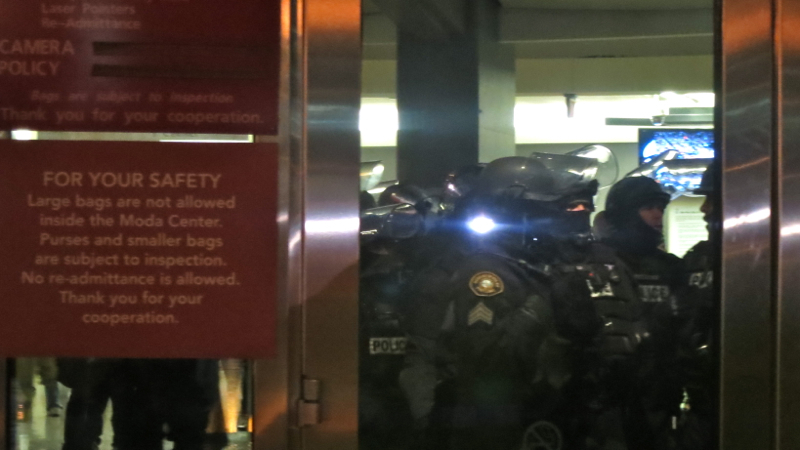 At one point, an attempt to enter the downtown Pioneer Place mall was made. 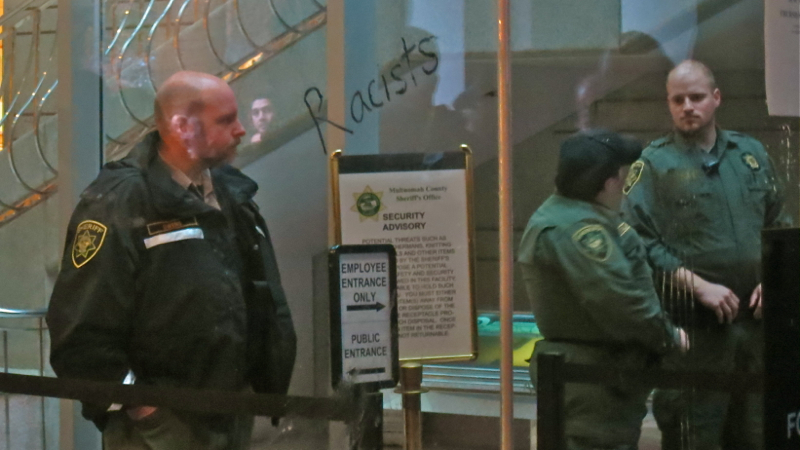 Security quickly bolted the glass doors shut. 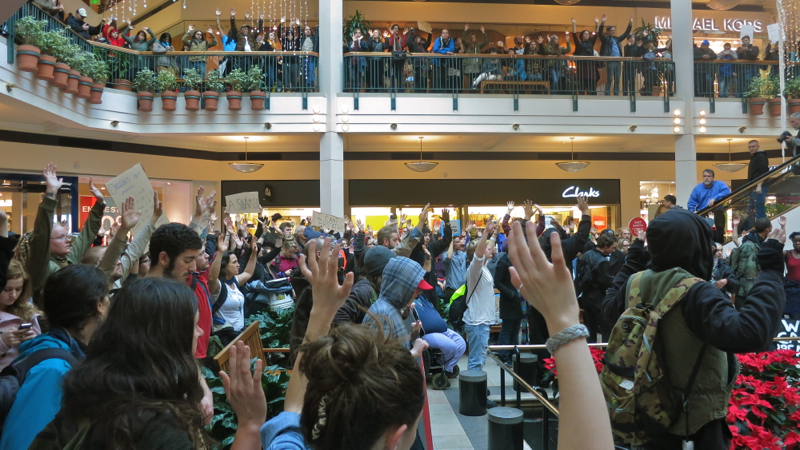 The tactic of filling malls with protesters was becoming nationally known among Ferguson solidarity protesters and police alike. 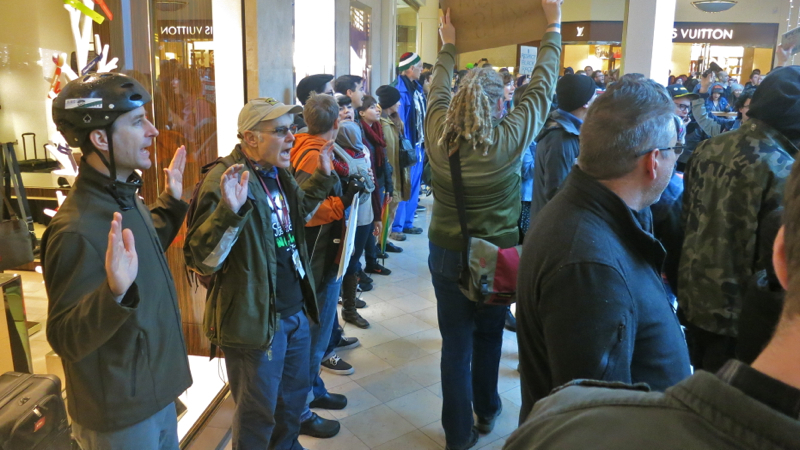 A short time later, a second attempt to enter the mall was made, with the front of the march sprinting forward to take control of the doors. 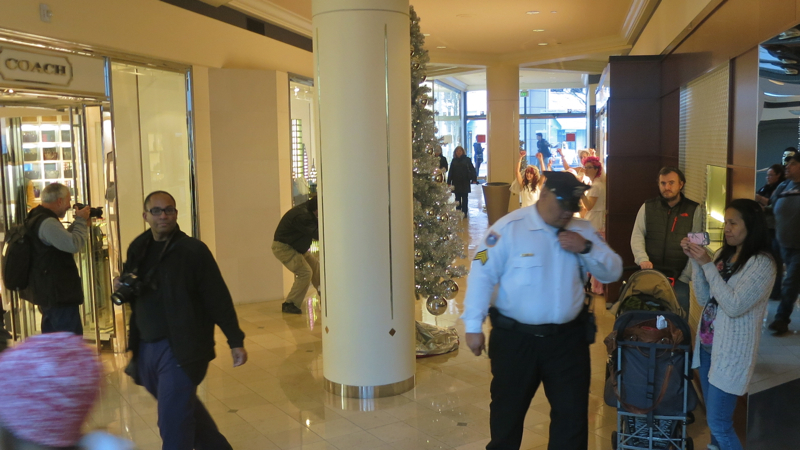 A white-shirted security guard made a futile attempt to push back with no avail. 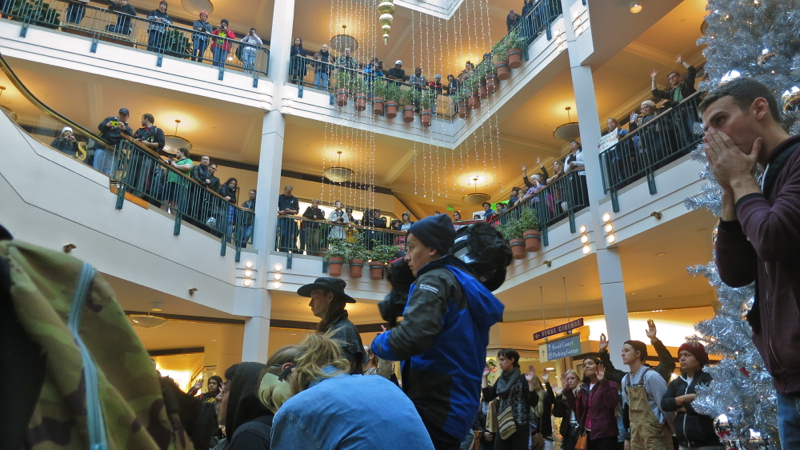 The crowd poured into the mall, chants echoing up and down four floors of commercial space. 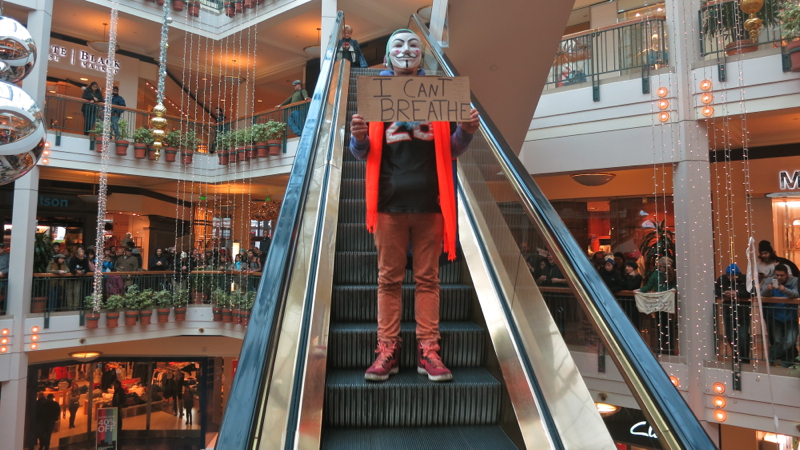 Shoppers stopped dead in their tracks, displaying a mix of responses ranging from confusion to throwing their arms up in solidarity. 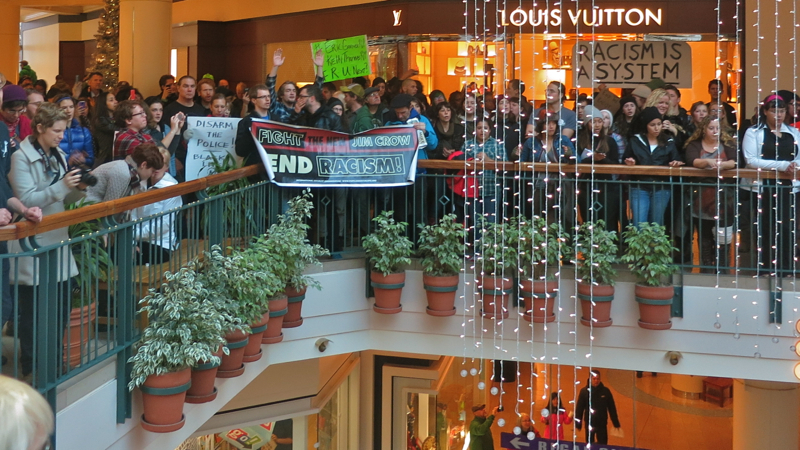 More chanting and drumming echoed through the mall as the red Don’t Shoot PDX banner made its way up and down escalators. 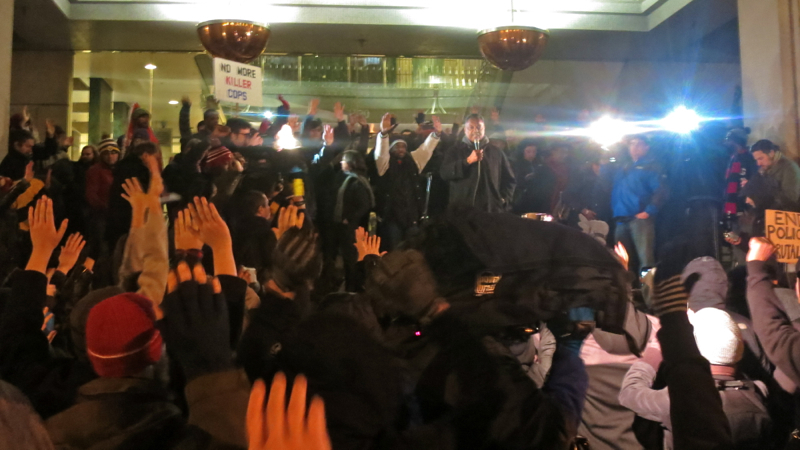 Eventually, the rotunda was full, and there was a call to observe 4.5 minutes of silence in honor of Mike Brown. 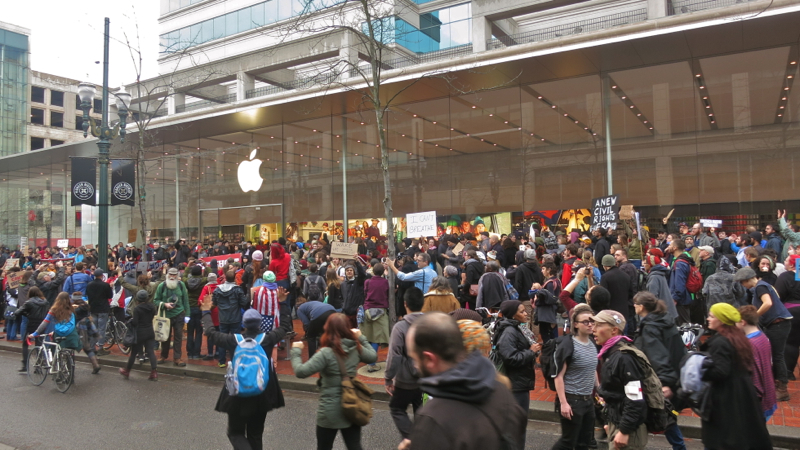 The silence over, the crowd exited the mall to the giant Apple store across the street. More speakers addressed the crowd. 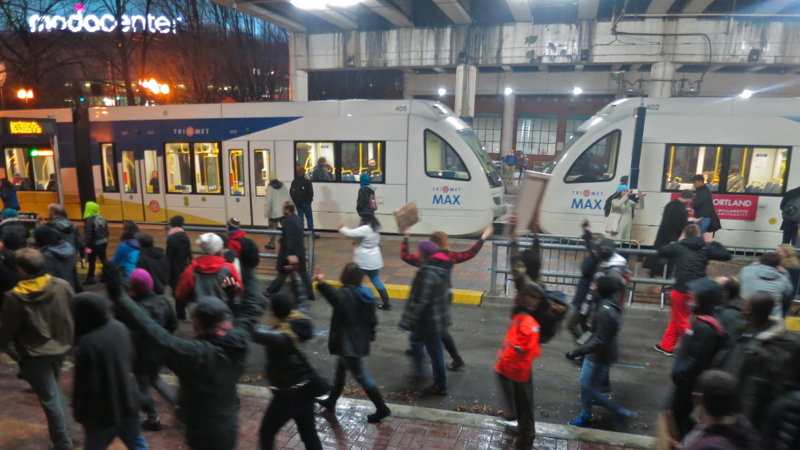 An oncoming MAX train was made room for. 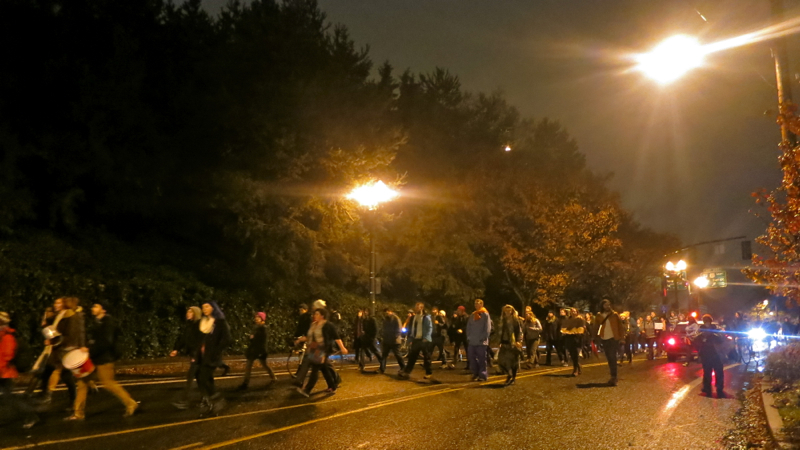 The march then continued on toward Naito parkway along the riverfront. 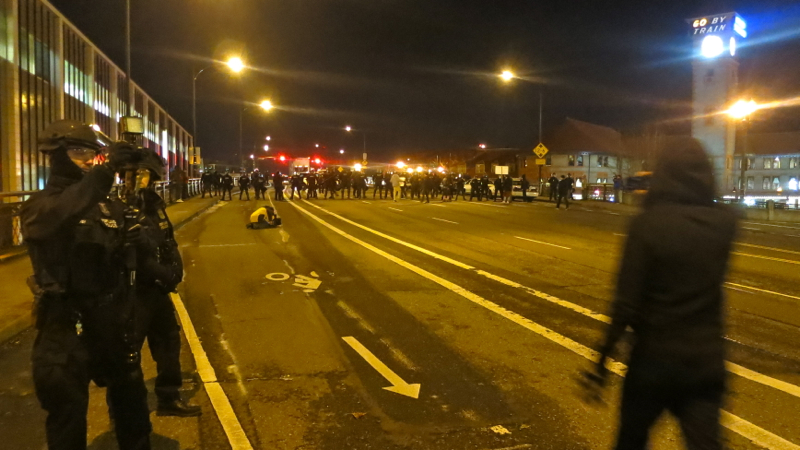 When the march passed under the Hawthorne bridge, a battalion of yellow bike cops joined the black-clad storm troopers guarding the crossing. Again, people remarked the irony of police shutting down the bridge themselves to prevent the shutting down of the bridge by protesters. From here, the crowd returned to downtown. A young black woman on the megaphone ordered the crowd to ‘take the Justice Center‘ and the march again turned into a sprint. 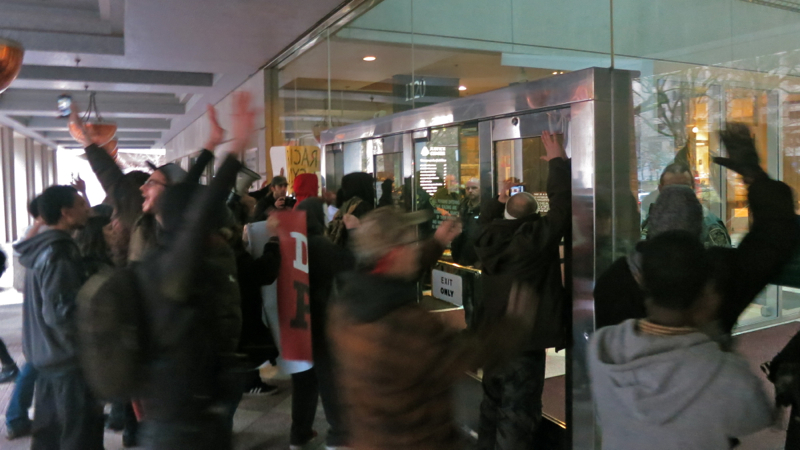 Those who first made it to the building’s entrance began pounding on the glass. 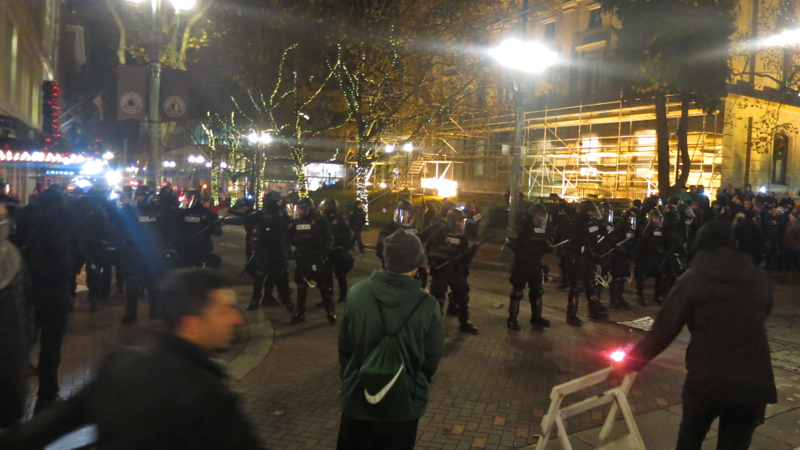 Green uniformed Multnomah county officers looked on from the other side. 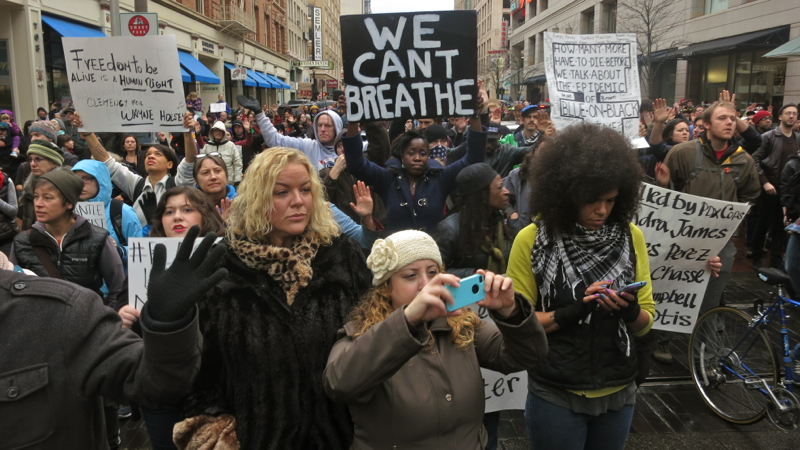 The crowd tightened in as dozens of black youth spoke about what this new movement means to them, and about what the killings of Mike Brown and Eric Garner mean for the nation as a whole. Many admitted before a month ago, they’d never been to a protest – yet were now the ones leading a movement. The speaking continued as darkness fell. 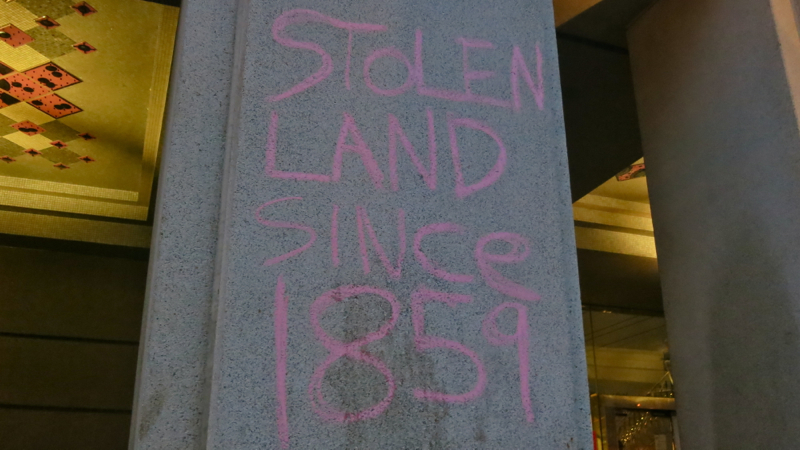 People wrote messages in chalk on the walls of the building and drew body outlines in the street. Several days later, some of them remained. 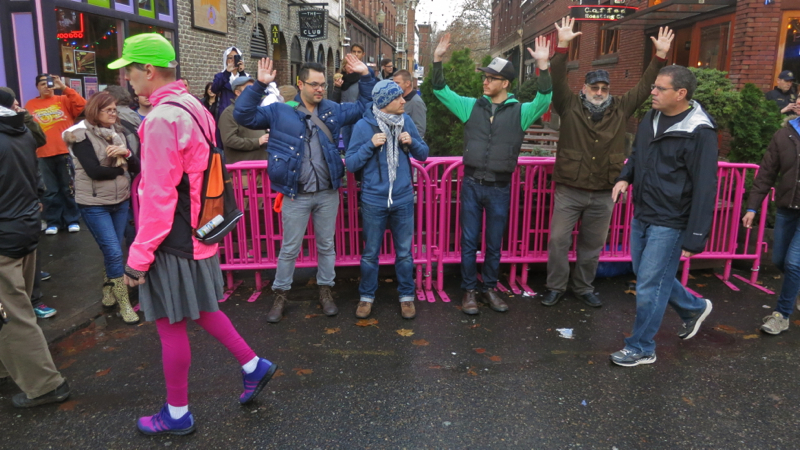 While this march felt equally successful, there was talk about how angry people still were about the previous Saturday when PPB had brutalized so many. 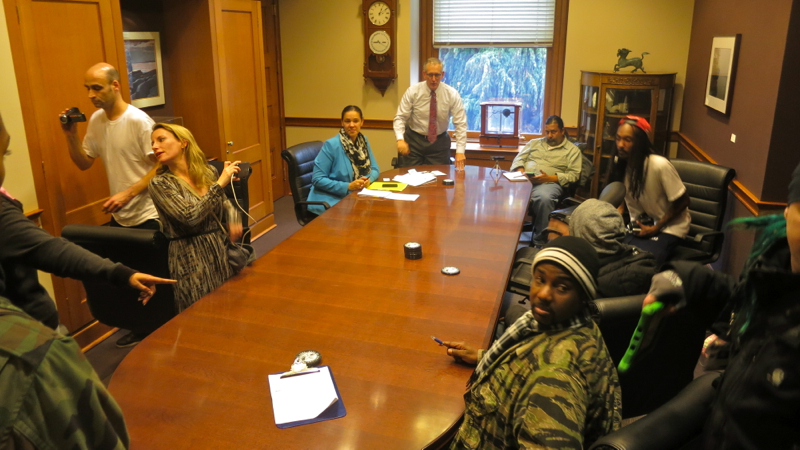 In the days that followed, it was announced that Don’t Shoot PDX organizer Teressa Raiford had been invited to meet with mayor Charlie Hales. Immediately activists saw red flags. Hales was trying to divide and isolate the players within the movement, people said. 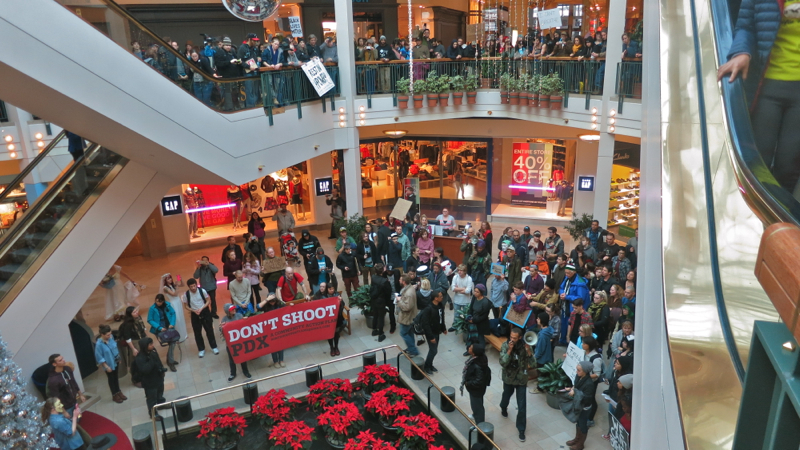 Other Don’t Shoot organizers agreed this meeting should be expanded to include “the entire city”. Whomever wanted to show up was now invited, much to the surprise of the mayor’s staff. 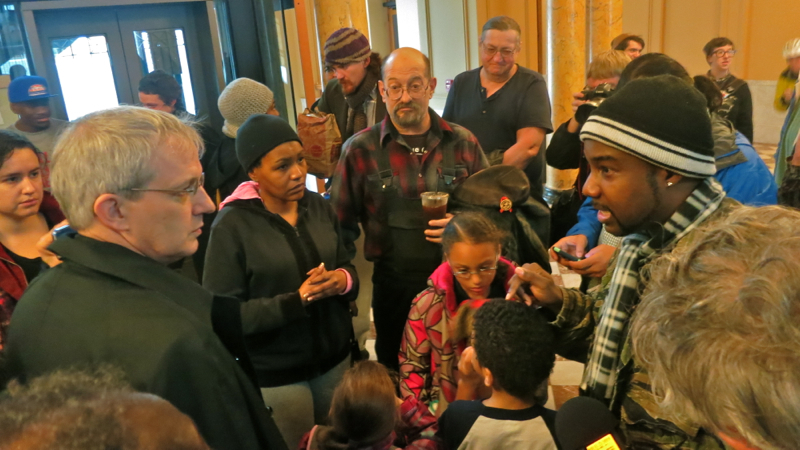 The scene on the third floor of city hall outside the mayor’s office proved chaotic. Initially, the crowd demanded Hales come out and address them all. The mayor’s aid insisted this wouldn’t happen, that only small groups would be allowed in a few at a time. The crowd was having none of it. Chants of “Bring the mayor out!” reverberated off the marble floors. Eventually, the mayor agreed to allow live-streamers and videographers into his office along with the smaller groups after initially saying they weren’t allowed. 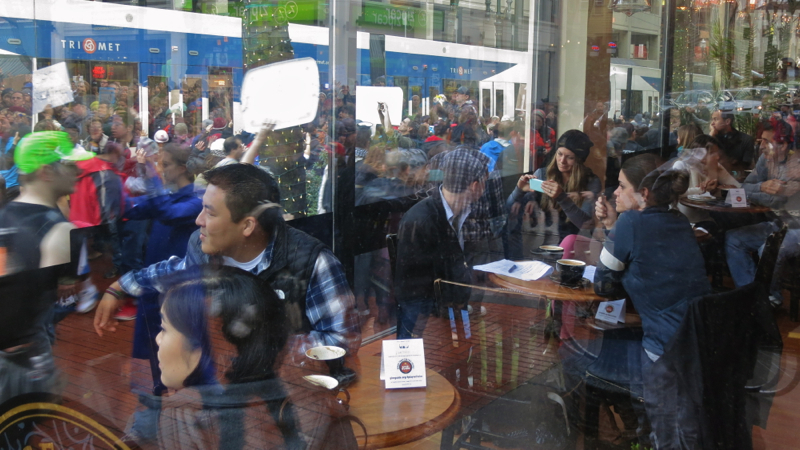 Many felt engaging individuals instead of the crowd was a divisive tactic. 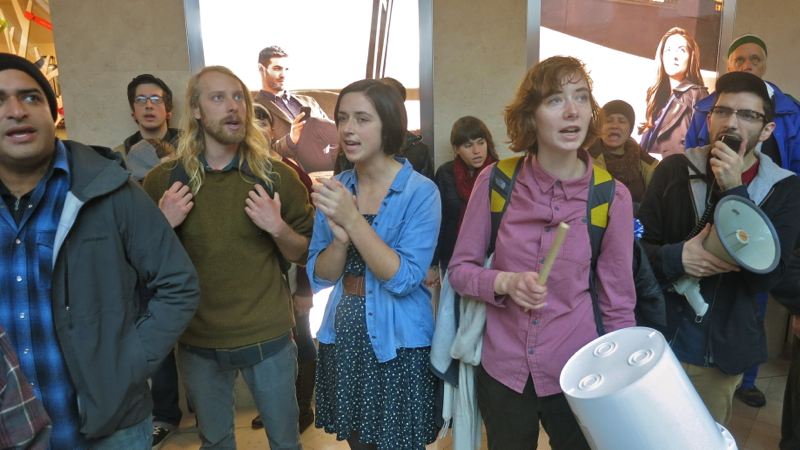 There were some tense moments as certain people were led into the office while the majority were blocked out. 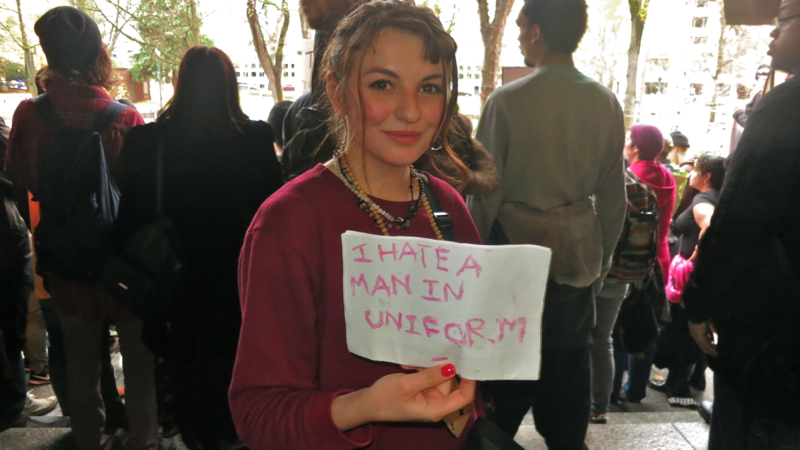 “We don’t support this!” the crowd began chanting. A sit in began. A woman loudly proclaimed that until the mayor came out, she wasn’t going anywhere. I was a bit surprised when I was asked on the spot by Don’t Shoot organizer Teressa Raiford to enter the mayor’s office as one of the ten arrested. While I’d hoped to get some photos inside, I hadn’t planned on personally speaking to the mayor. Hales was there with his police bureau liaison. He spoke little, listened much, and wrote down many things that I and others in the room had to say about our experiences that night. 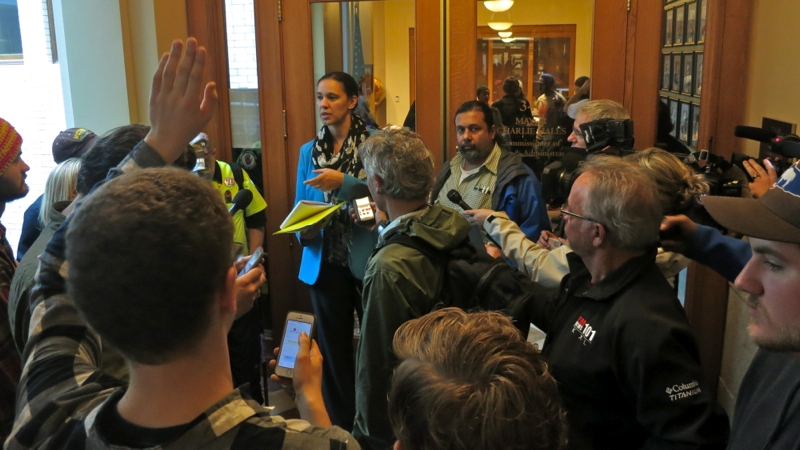 While the systemic problems of the PPB are similar to other departments around the country, there were particular instances of local police misconduct discussed. 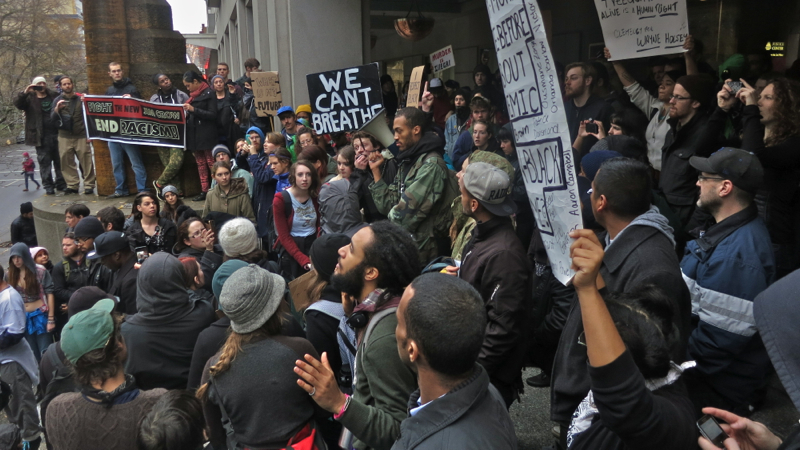 In particular, the rules of engagement police use when dealing with protesters. Hales asked if I felt there’d been a difference between the first night Saturday protest and the second daytime Saturday protest. I agreed there was, but credited the time of day as being the biggest factor for PPB’s level of force. Our group’s brief session concluded, I exited the office as a new group of mostly young black men and women took our place. While I wasn’t privy to their own conversation, I’m told it contained many emotionally sensitive conversations about personal experiences involving Portland police. 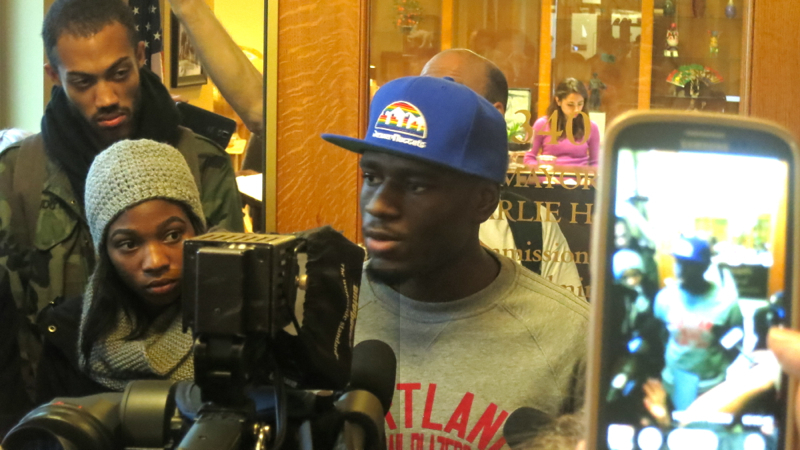 Back in the hallway, I mingled with media sharing our experiences. Different groups exited and entered the office. The crowd eventually dwindled. 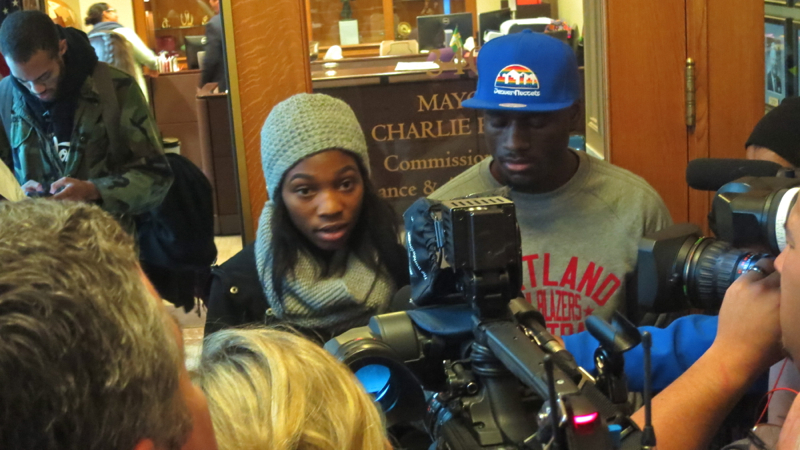 Finally, the youngest of the Don’t Shoot organizers emerged. The press swarmed in tight for statements. There was a general sense of dissatisfaction, that the mayor was only paying lip service to them with little intent of making needed policy changes. 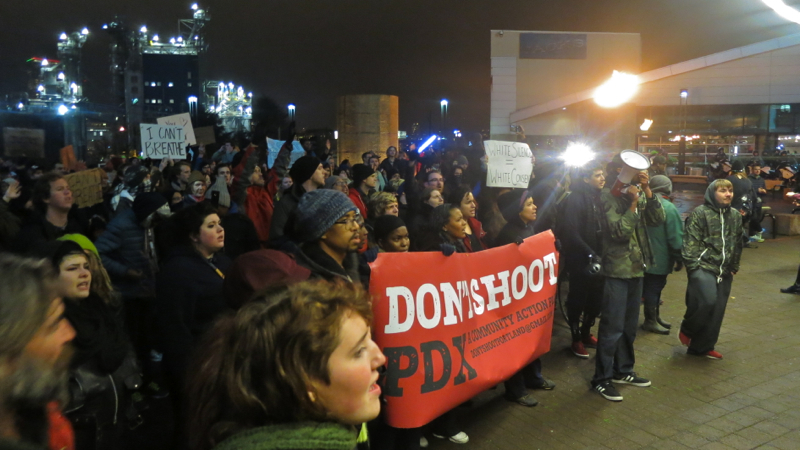 It was announced that continued monthly meetings between the mayor and Don’t Shoot PDX would continue. The final person to speak the media here was 19 year old Lauretta Austin who stated she felt little action would come from city hall. But, she said, “Change will come.” The remaining crowd agreed with applause. Where these young men and women go from here should be of great interest to local media and to other established organizations concerned with racial injustice and police brutality. With little experience and bold hearts, these kids have created a movement in just a matter of months and weeks. 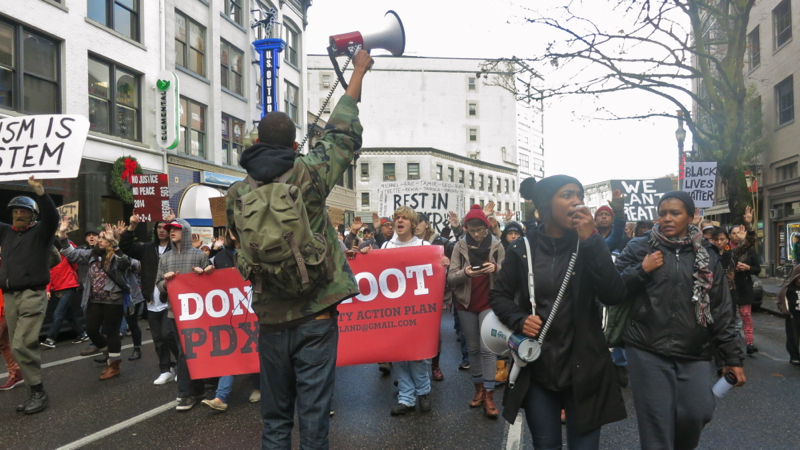 Don’t Shoot PDX has rocketed to the forefront of a new chapter in the ongoing civil rights movement, and their momentum has the support of thousands. 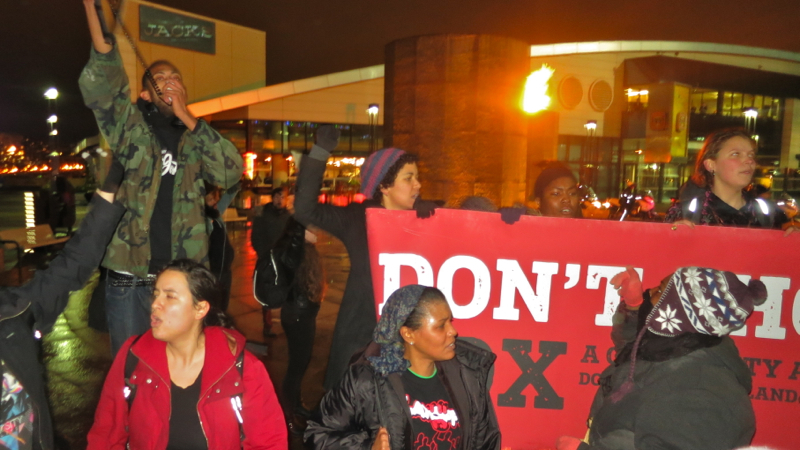 When it comes, these new activists will be the ones to make true change happen. Great blog, have an issue with this part however. 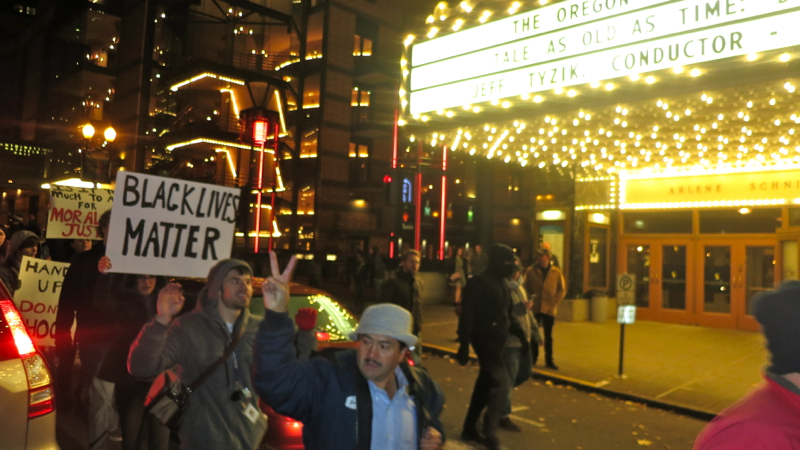 This was an independent protest started by activists not affiliated with Don’t Shoot PDX. 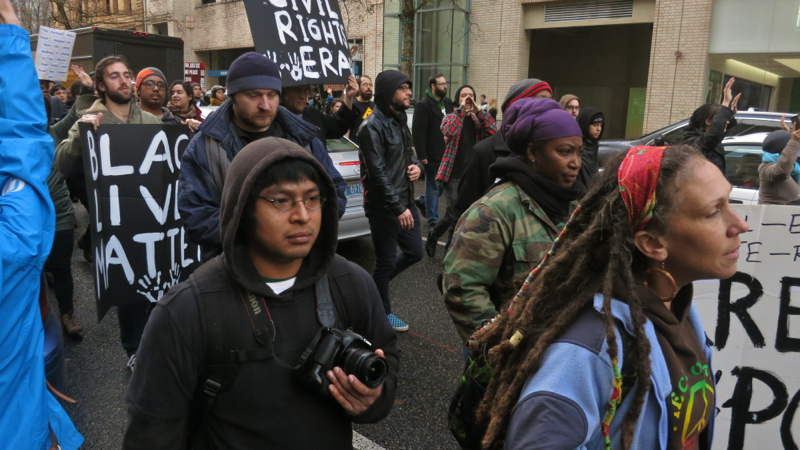 The march was originally planned for Justice Center but was moved at the last second to NE Portland to support a community dialogue event and engage with members of DSPDX. 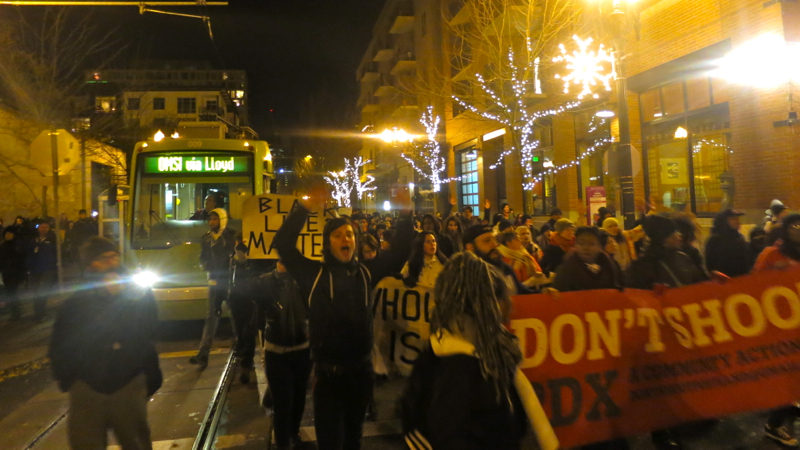 DSPDX initially wanted nothing to do with the protest. Just a FYI – you may have got some bad information but please do not conflate this subject. Give credit where it is due. That’s not accurate. 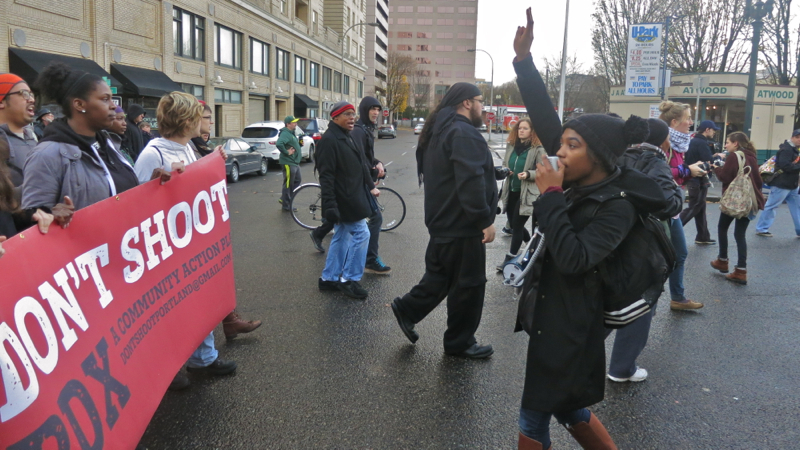 The march that came south from MLK blvd was in fact led by Don’t Shoot PDX organizers. Their red banner was out in front of that march and the larger march once both combined. Really though, issues of ownership are pretty silly in light of people being murdered in the street. “Issues of ownership are pretty silly in light of people being murdered in the streets” is a way of deflecting and shielding yourself from criticism. You have no problems with ‘ownership’ when comes to your organization. Thank you for this excellent photo essay. You have my ongoing admiration.